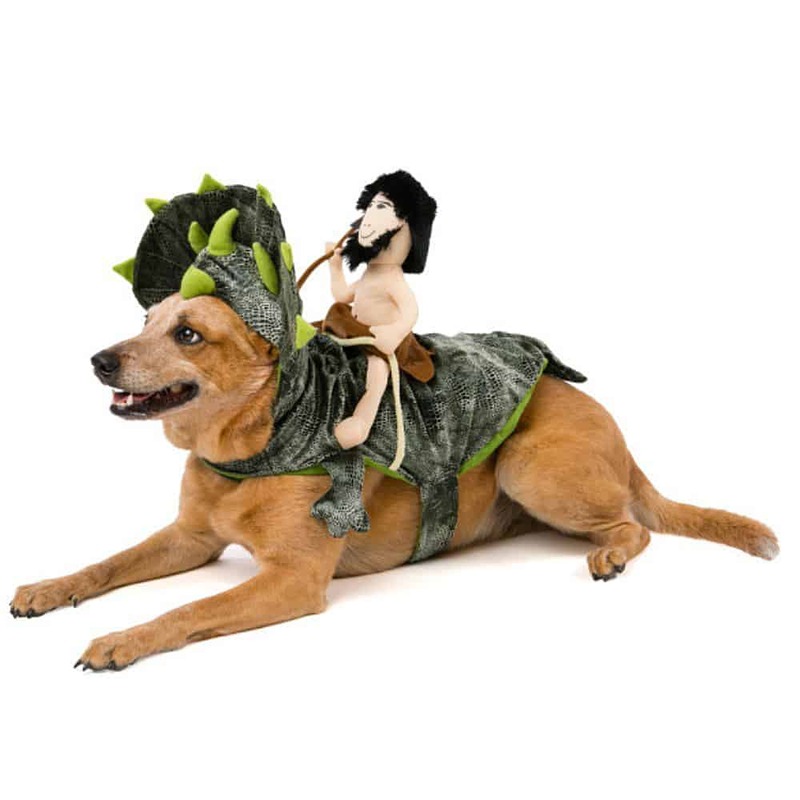 Are you looking for a special occasion outfit for your beloved dog, or maybe something that will make people and their fellow mutts laugh? 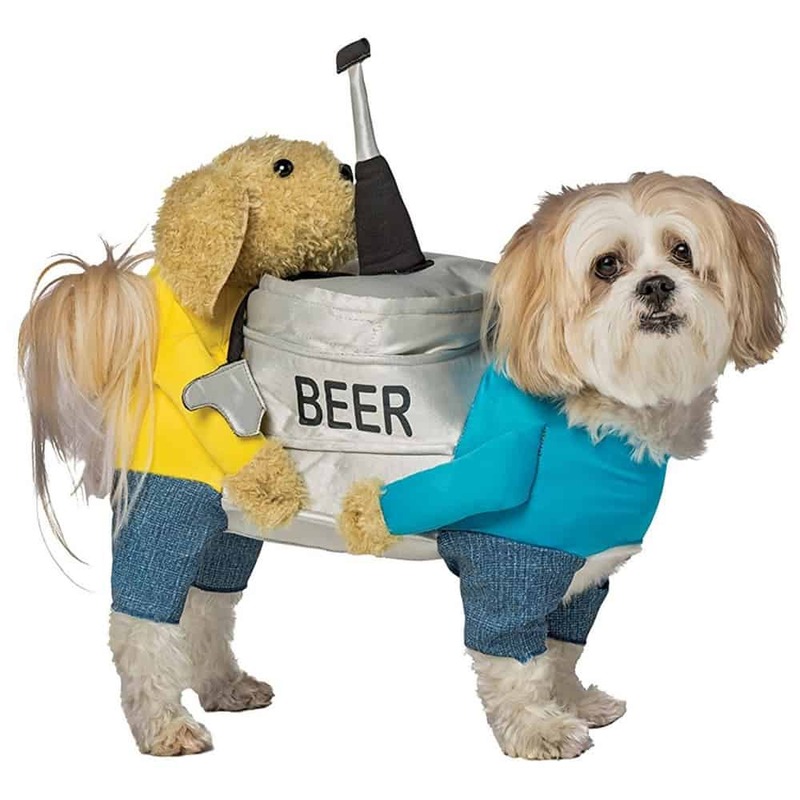 This list contains some of the best dog costumes around. We have included some simple options, for a subtle seasonal touch, as well as some extravagant ensembles if you are planning to go all out for Halloween or a fancy dress party. Size doesn’t matter! Small or large, there will be a costume here that fits perfectly. 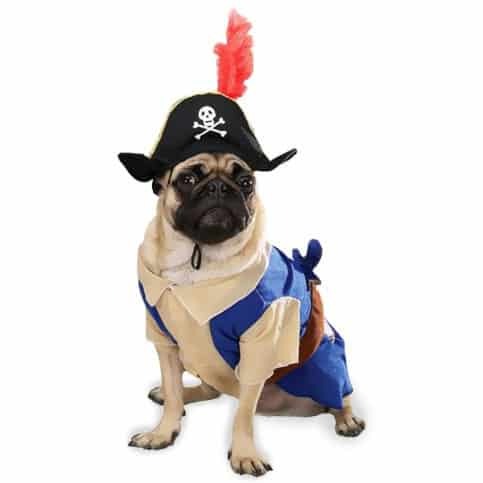 We’ll start with the small dog costumes first but you can jump straight to the large dog costumes section if you want to. 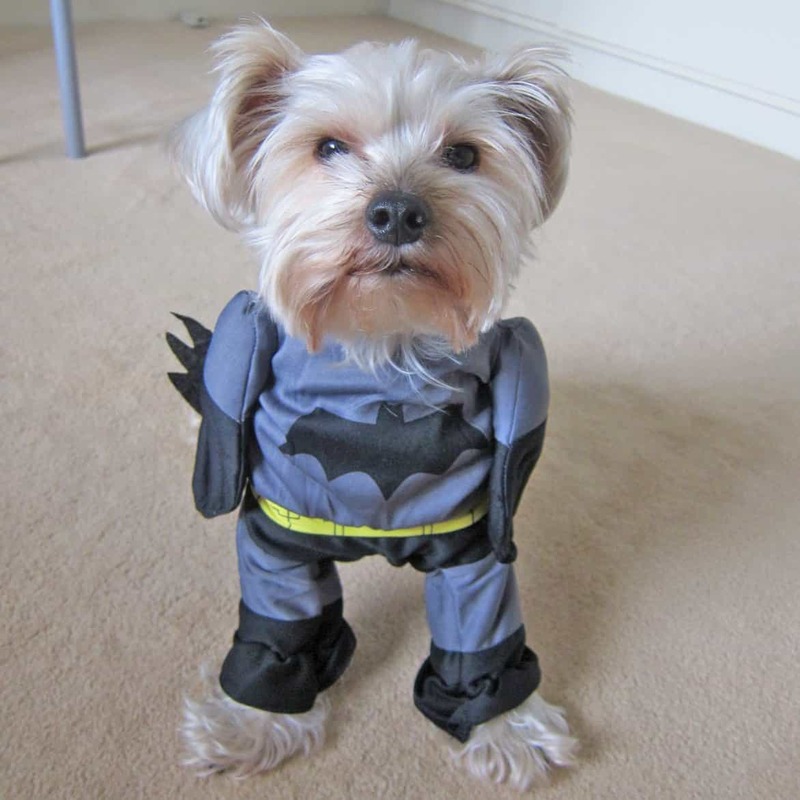 Petit pooches really enjoy dressing up. 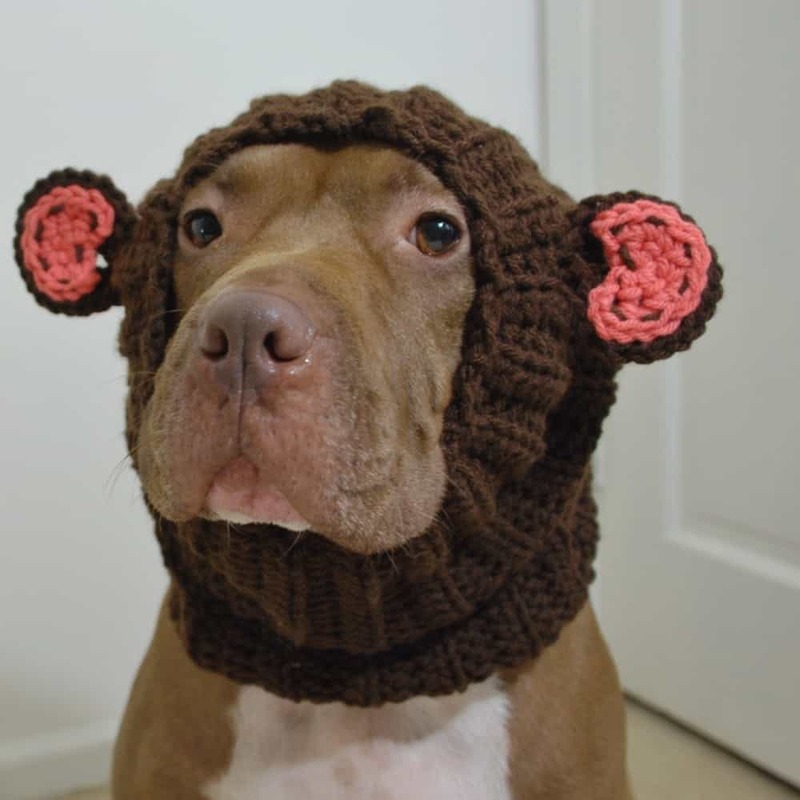 They also tend to get a bit chilly in winter, so having something warm to put on is vital. 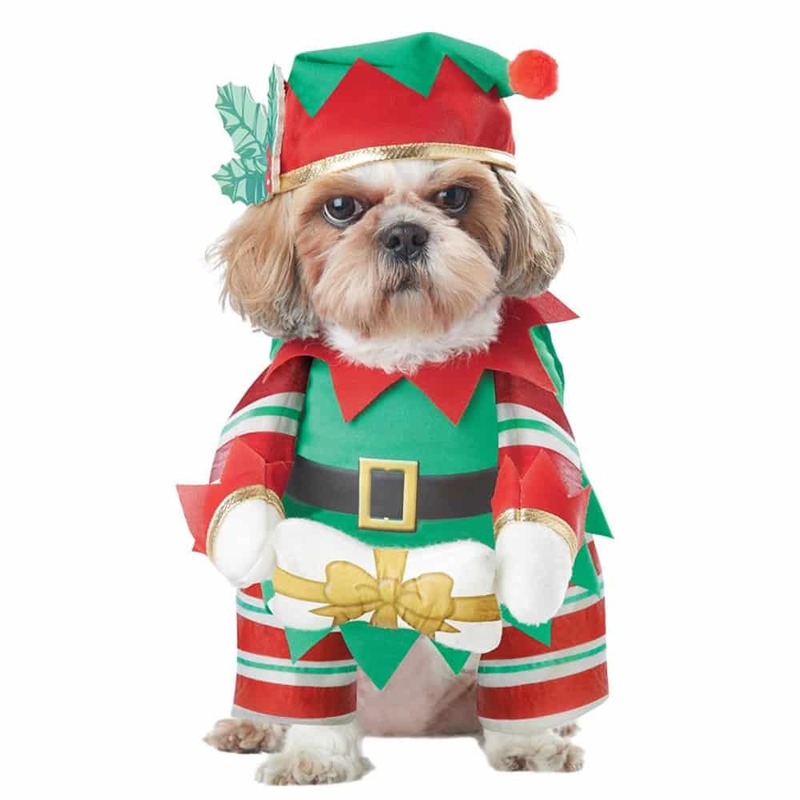 Special thought needs to be given when searching for small dog costumes because these pups are often fairly low to the ground, and they can’t handle anything too bulky. It is also not recommended to put anything heavy on little dogs as it can cause back issues. There are a wide variety of body shapes among little breeds, with some being particularly unique like the Dachshund. 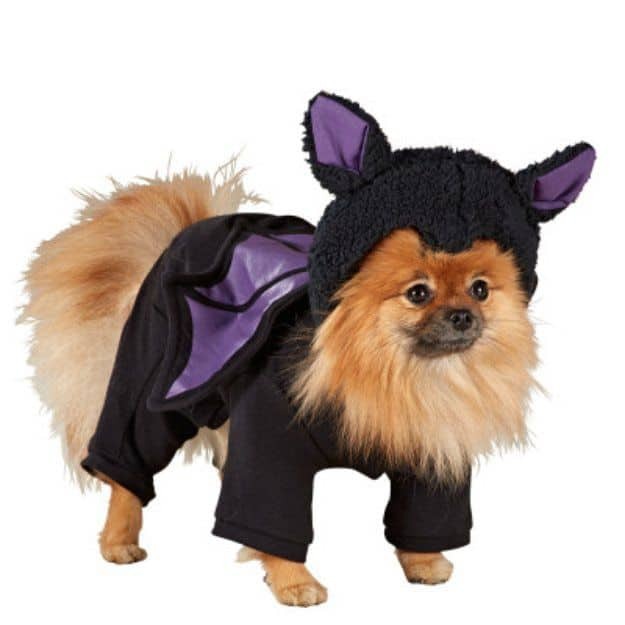 If you are on the hunt for small dog costumes for Halloween, this bat themed option could be ideal. 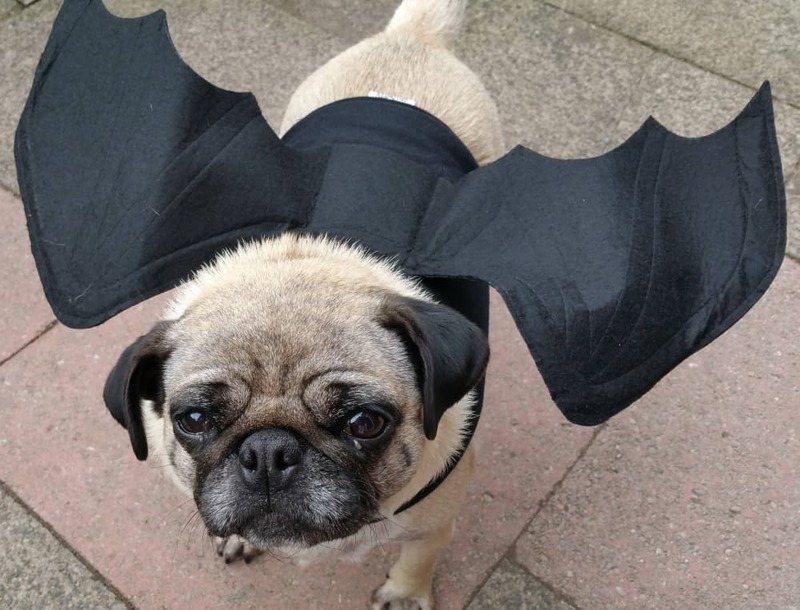 The bat wings are designed to fit dogs with a small circumference, the chest measurement is 20 inches, 14 inches around the neck, and the length of the coat is 9 inches. 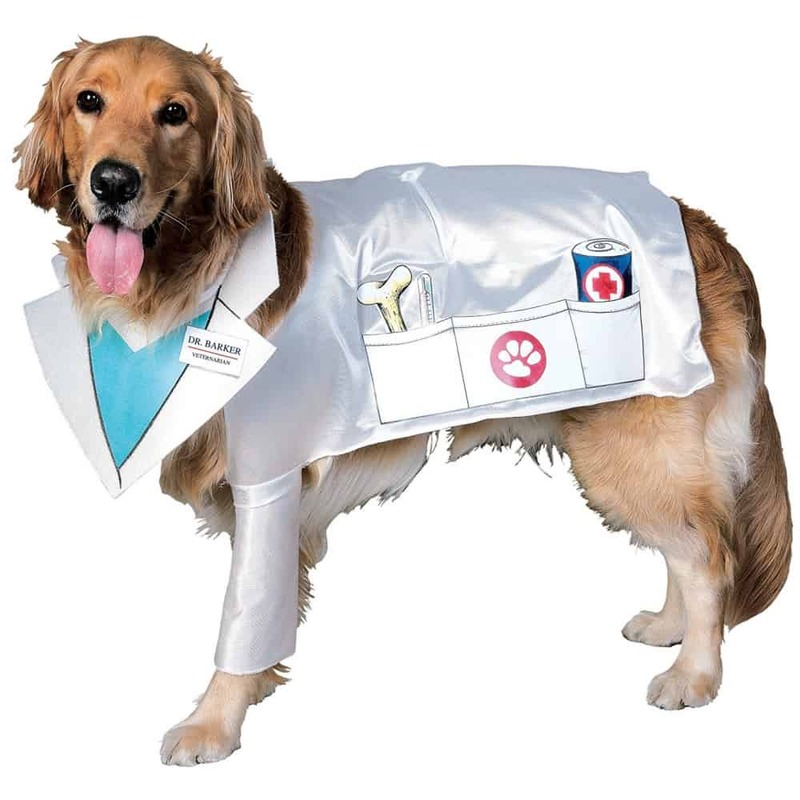 It is not a problem if your dog’s measurements are a little below this. 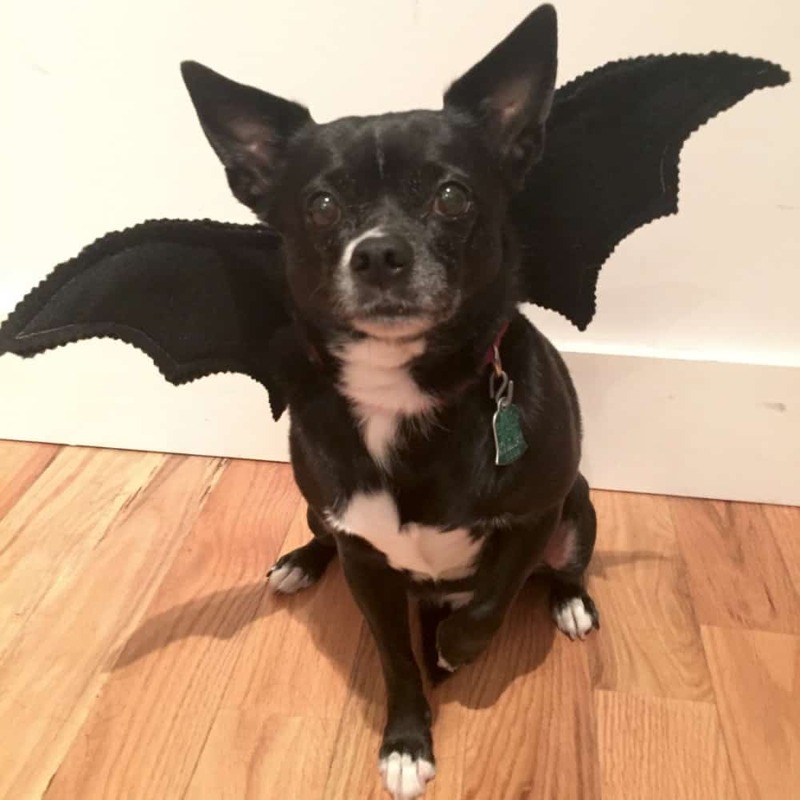 The basic structure is a normal dog coat in black, with wings protruding from the back section. 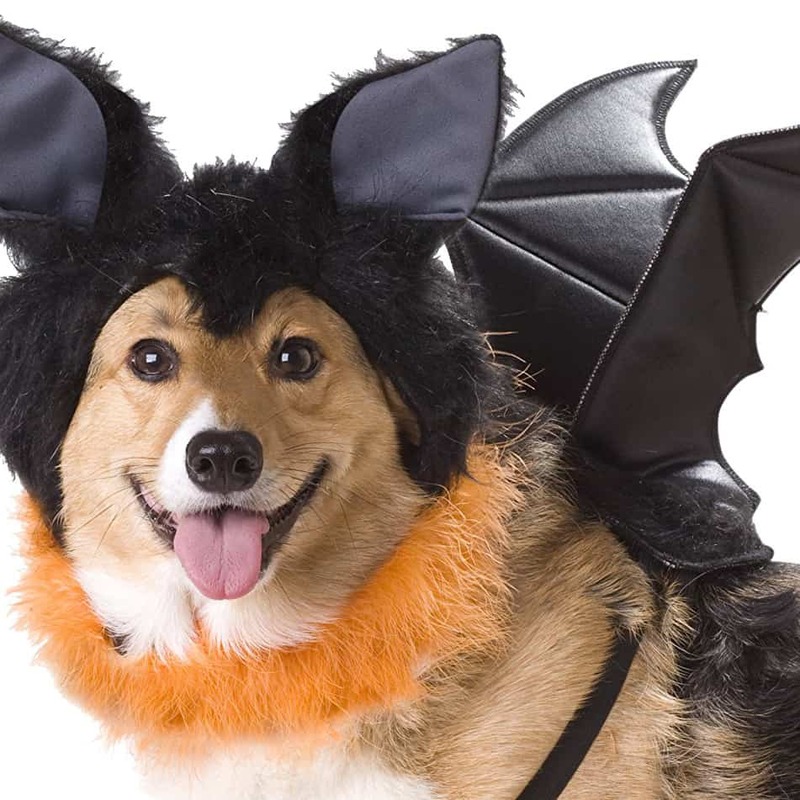 The bat wings are made with very thin fabric and barely weigh anything. A great addition to any trick or treating group, you will be sure to score some extra candies. Yes! 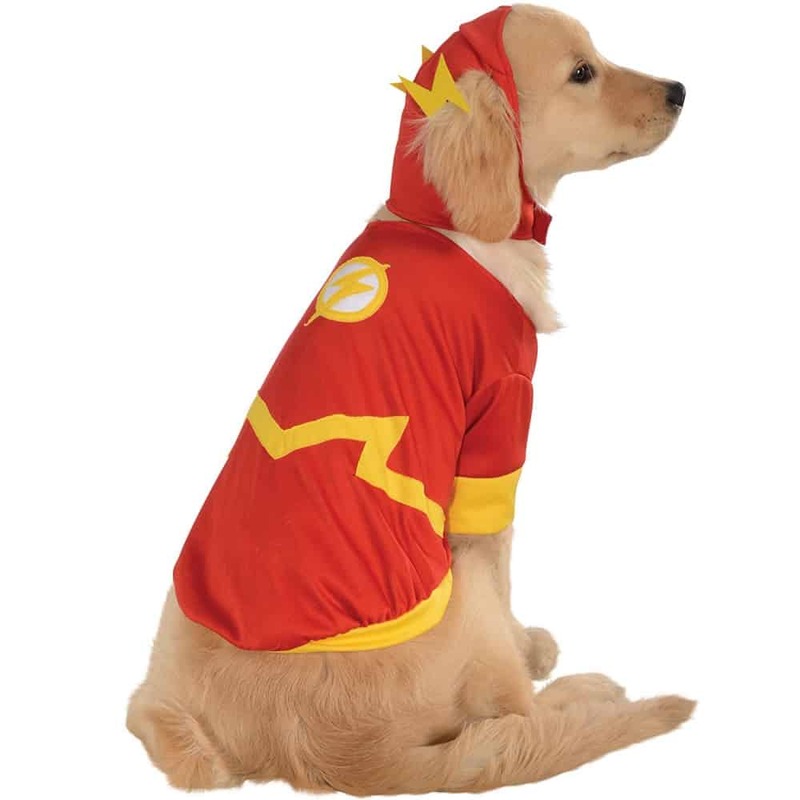 We have a superhero option in the small dog costumes category, the Robin outfit from Teen Titans. The costume includes a classic green and red Robin shirt with an “R” emblem attached. 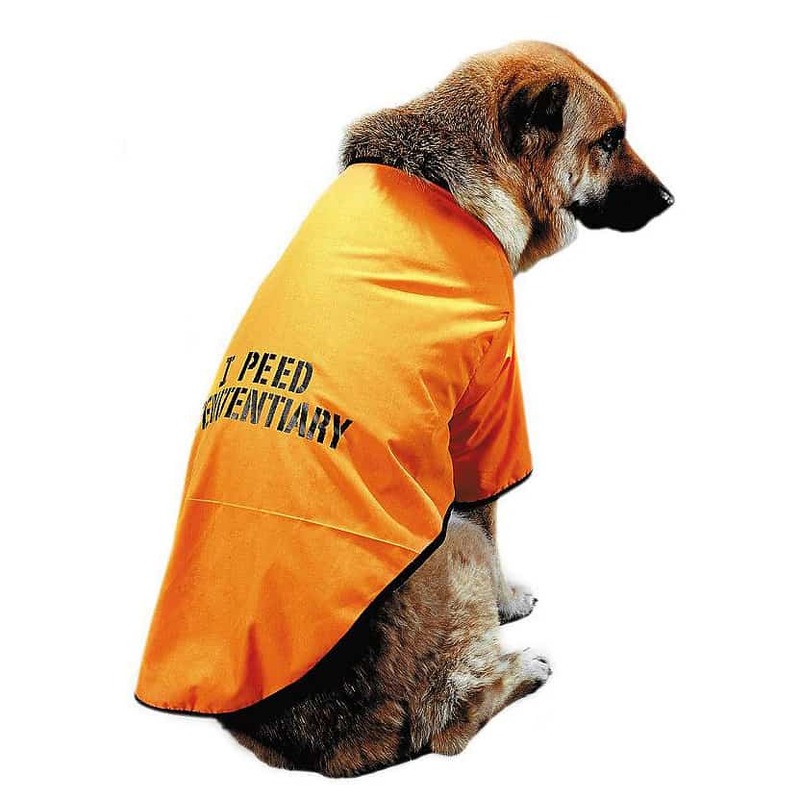 This shirt is secured with Velcro and the long sleeves can easily be rolled up if you have a particularly short pet. There is also a detachable yellow cape and black mask included. 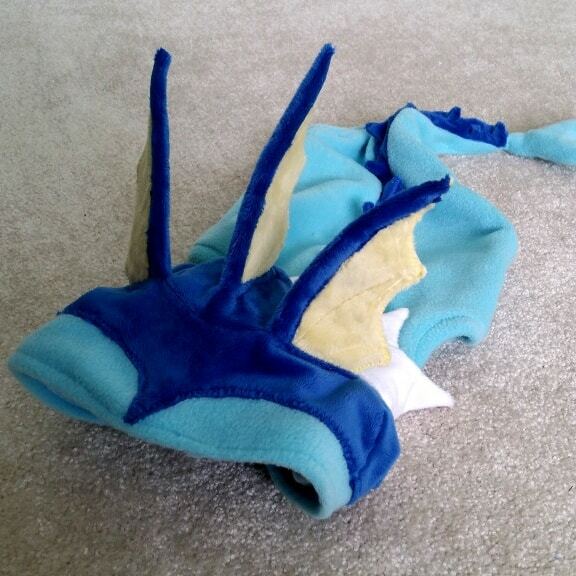 The small size fits a 14 inch chest, and 11 inches from neck to tail. 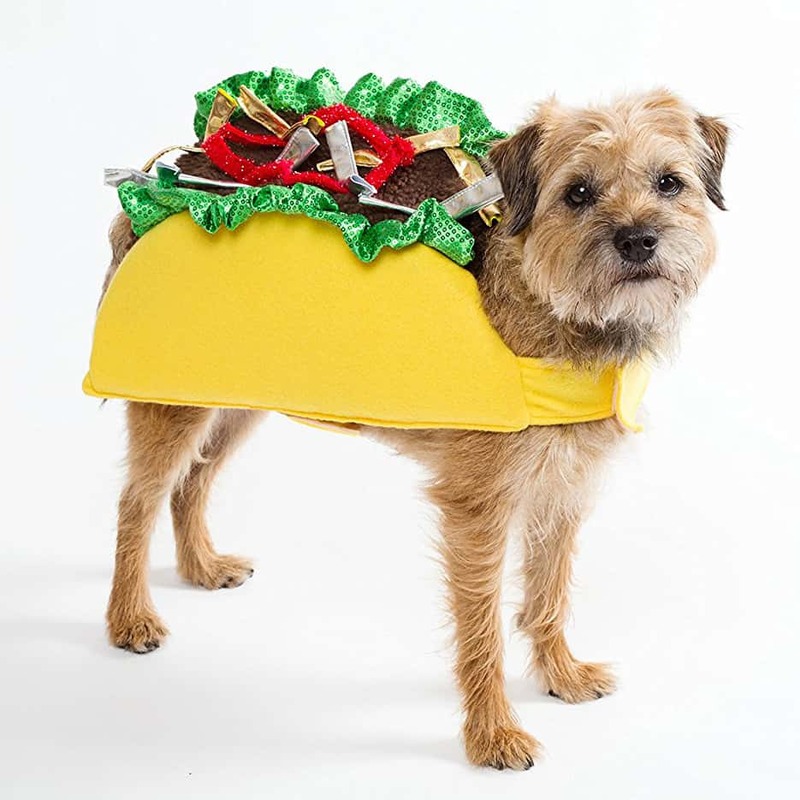 The suggested breeds for this costume are Chihuahuas, Pomeranians, and small Terriers. 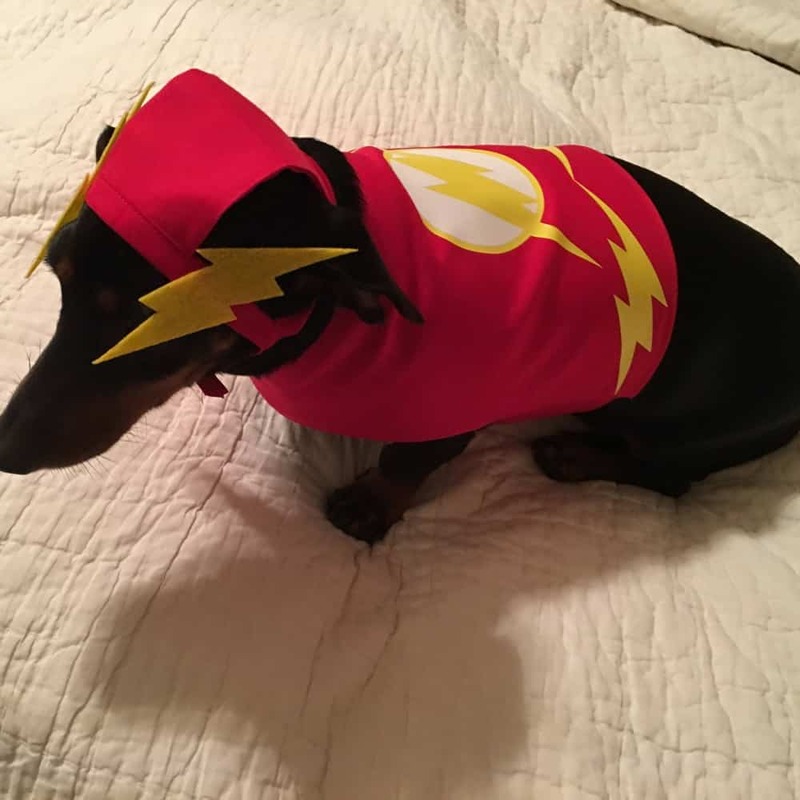 Your little pup is sure to look super cute. If you are looking for something cheap, the happy hour outfit provides great inspiration for something you could make at home. 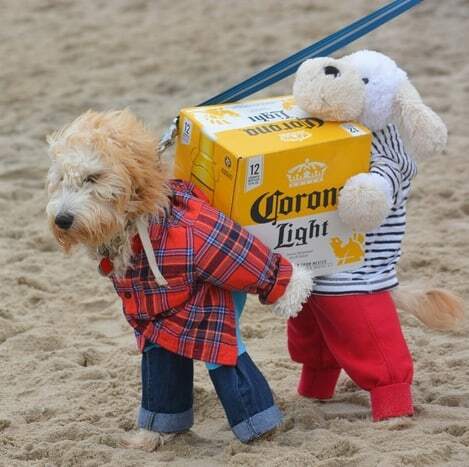 It is a dog, dressed up as two dogs carrying a box of beer – what could be better? 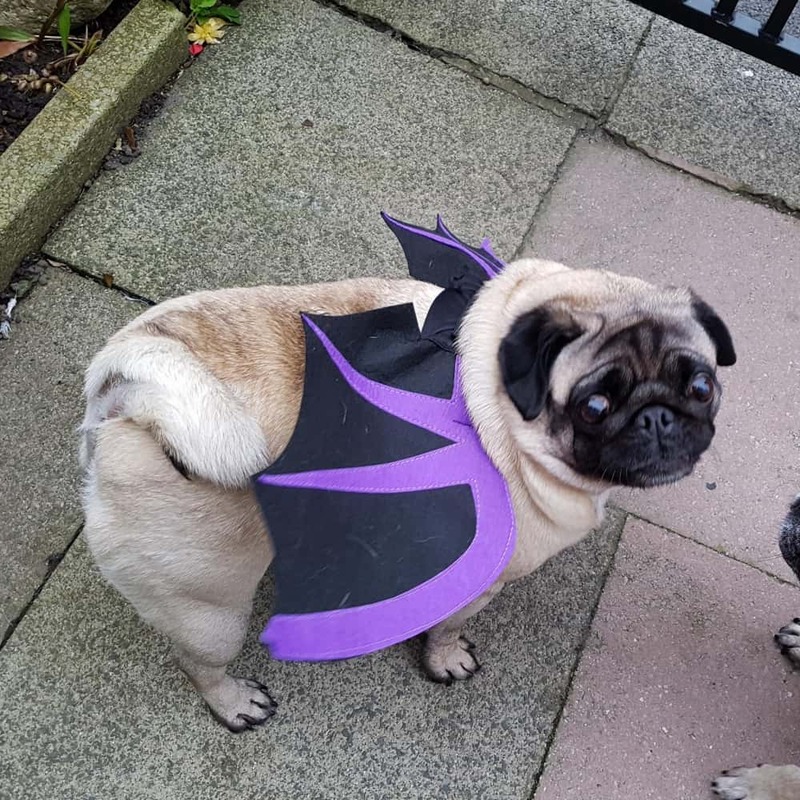 To create the same effect you will need to dress up the front and back half of your dog separately and use a cuddly toy puppy where the second dog’s head should be. 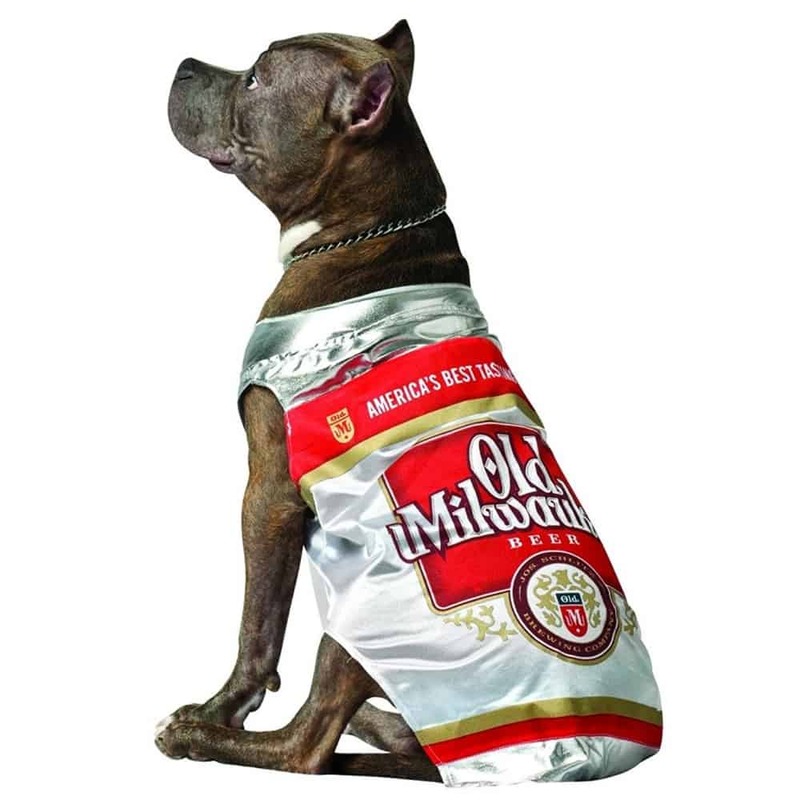 Then cut a doggy sized hole in an empty beer box, attach a belt at the bottom, and place it over you pups back. The box will be nice and light, so it is not uncomfortable for your dog, although if you have a particularly boisterous pup, it might take a bit of ingenuity to get the box to stay in place. The happy hour costume requires some effort, but the final result is hilarious. 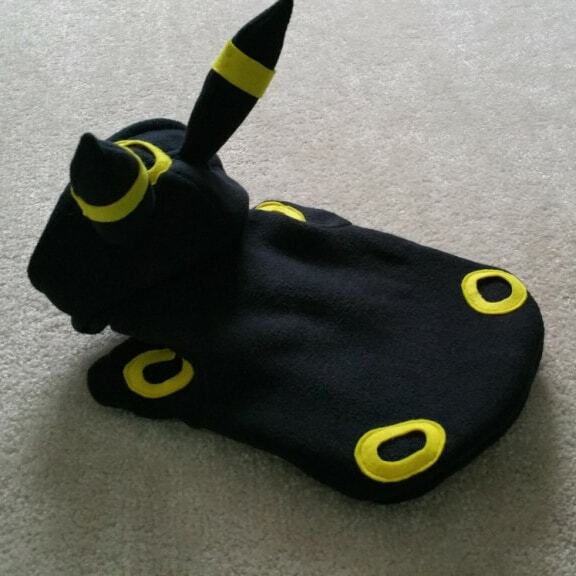 This Pikachu outfit is handmade with cozy fleece material. 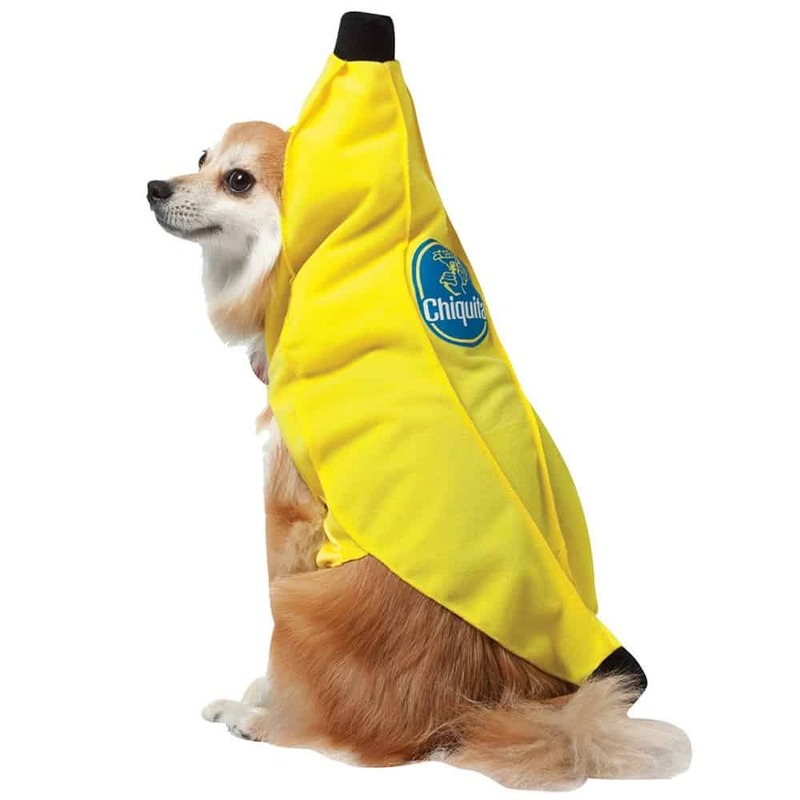 Meaning that it is not only a cute costume, but also practically very useful for keeping little dogs warm. 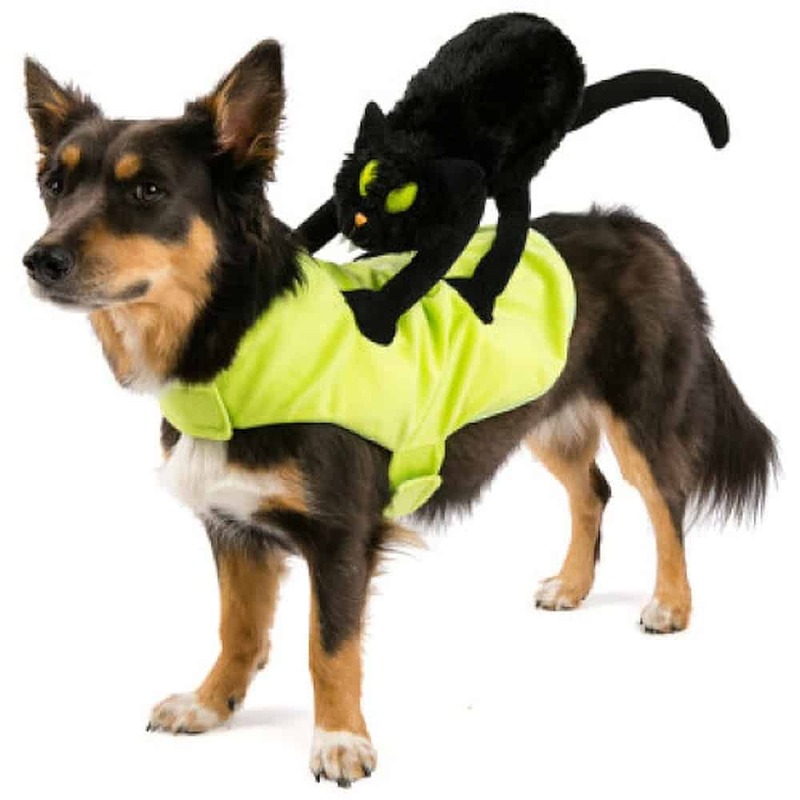 Ideal if you plan to take your pet around trick or treating when the weather is cold. 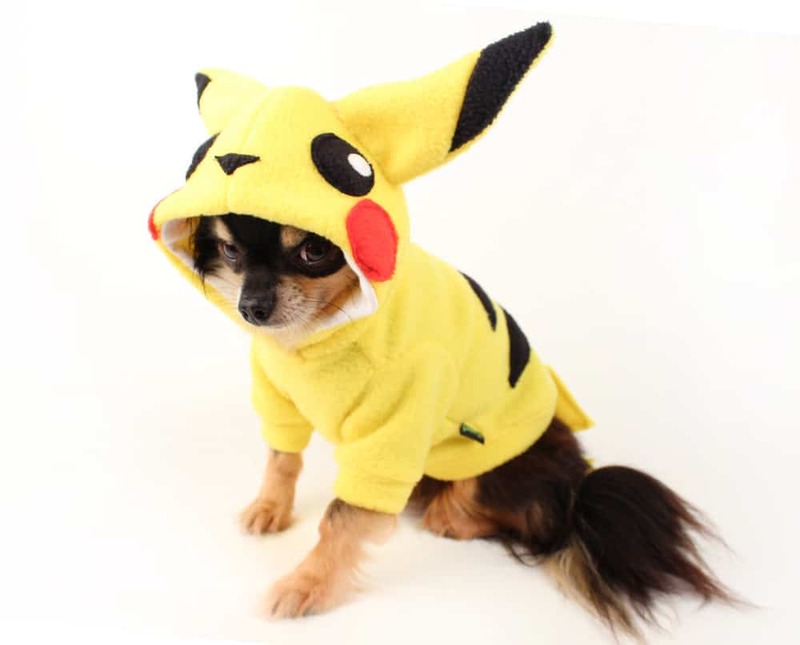 It is a standard dog coat shape in yellow, but has long sleeves for the front legs and an oversized hood which is Pikachu’s face. 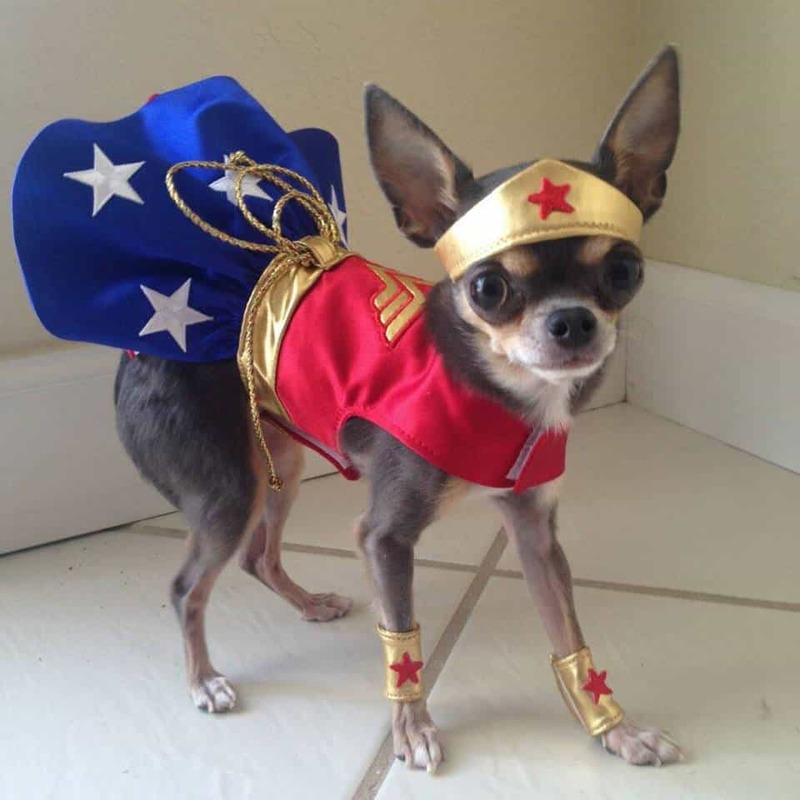 There are several size options available for small dogs; xxs is recommended for very tiny creatures, for example Chihuahuas. Extra-small could be suitable for Yorkies or Maltese dogs and small for Pomeranians or Shih Tzus. The exact measurements are readily available. 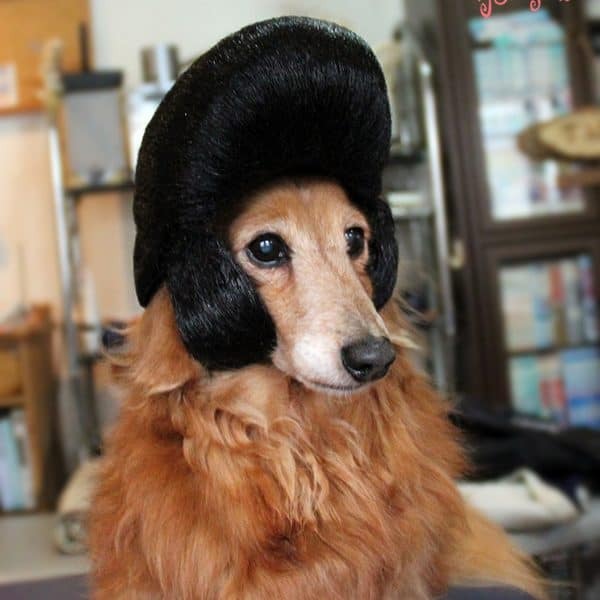 If your dog is a rock star at heart, this get-up could be tremendous. 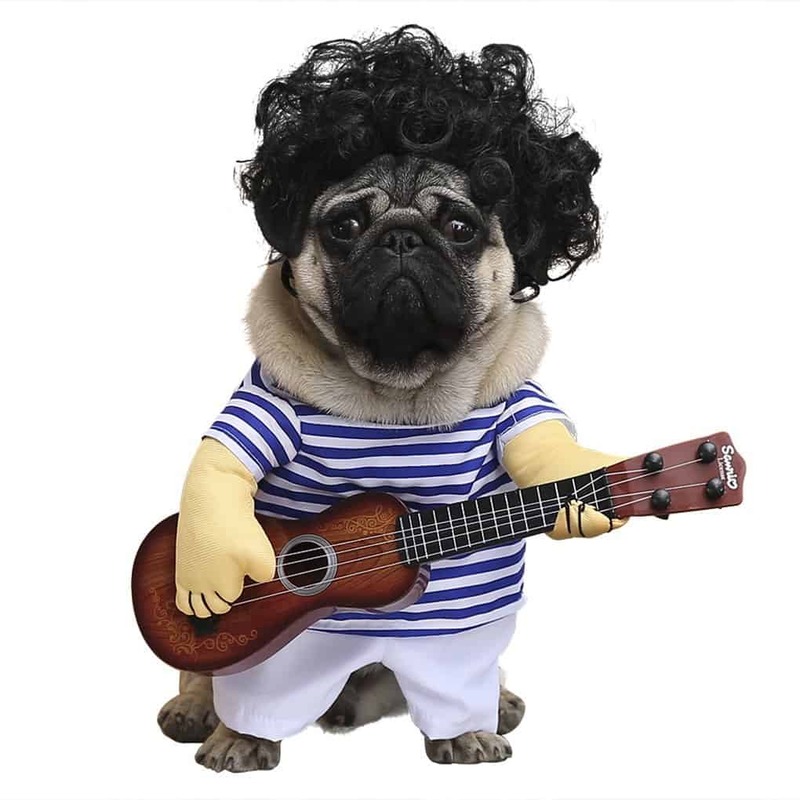 The costume consists of a blue and white striped shirt with stuffed arms holding a guitar in front of the dog, as if he is playing it. The shirt is made from high quality polyester and is soft and breathable. 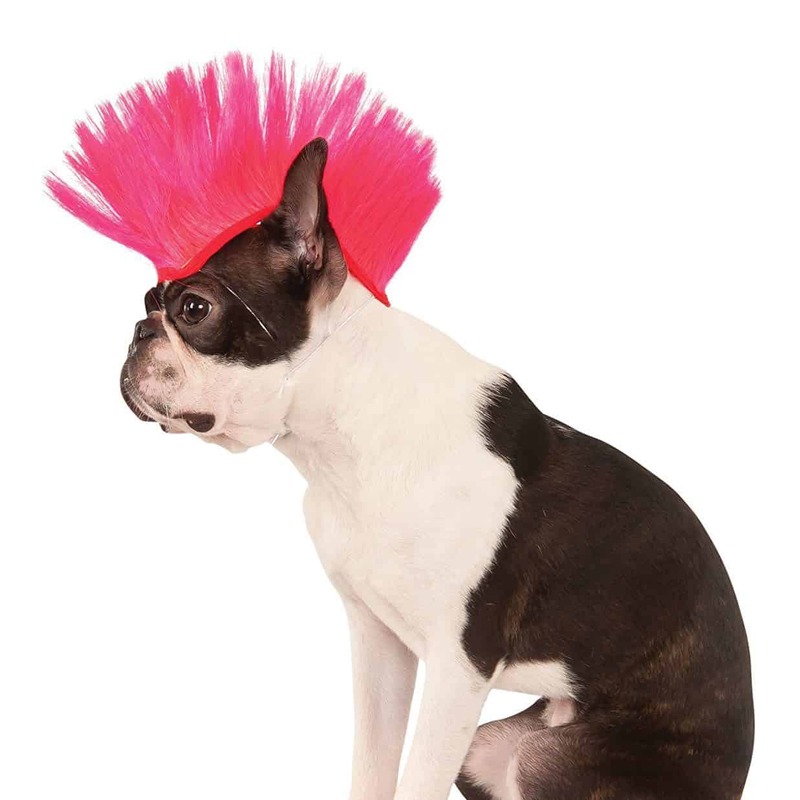 For the guitar, it is light weight and shouldn’t cause your dog any problems when moving around. 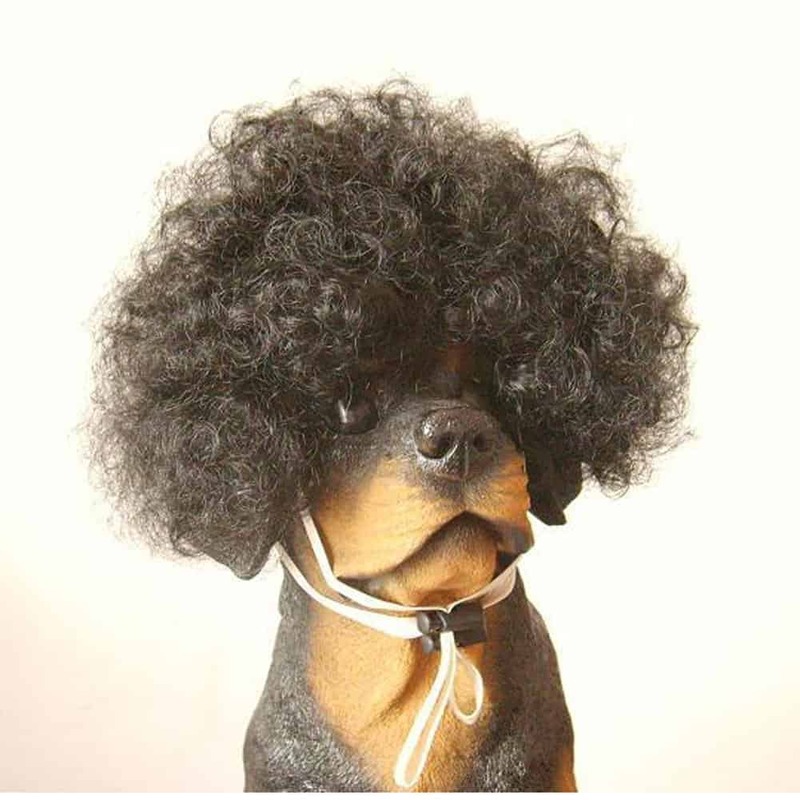 There is a curly wig included for extra rock star effect. The wig is held in place with two elastic bands. 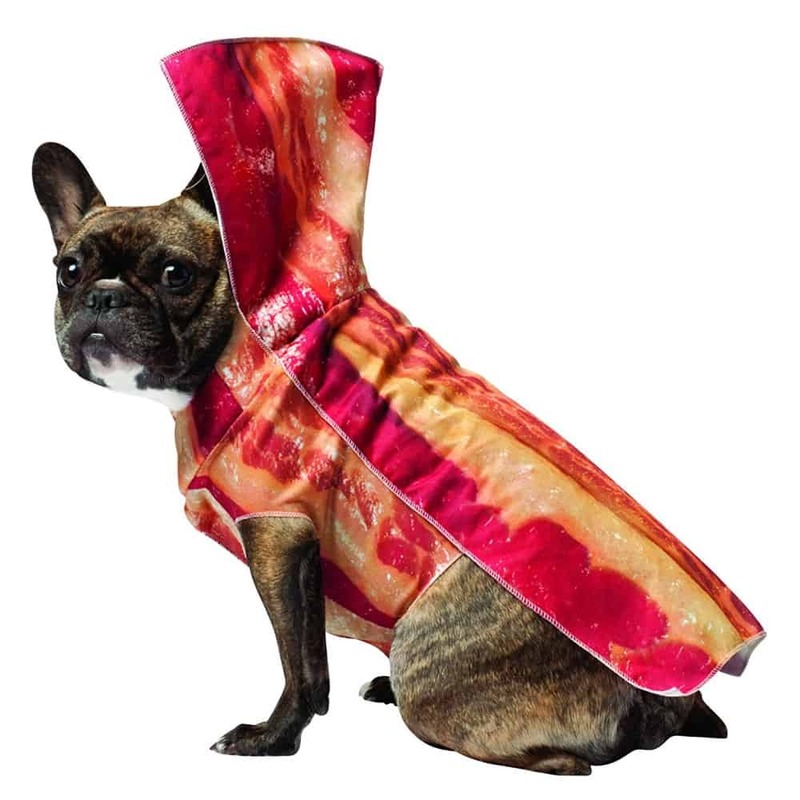 This would make a great Halloween or fancy dress party costume. 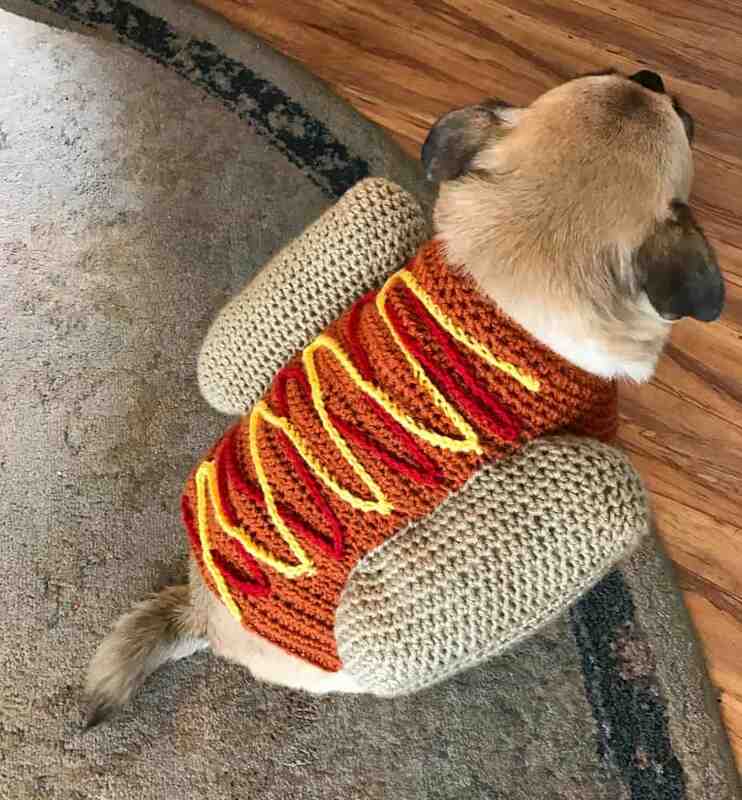 Potentially the cutest of all small dog costumes, the hotdog sweater is ideal for little pups. 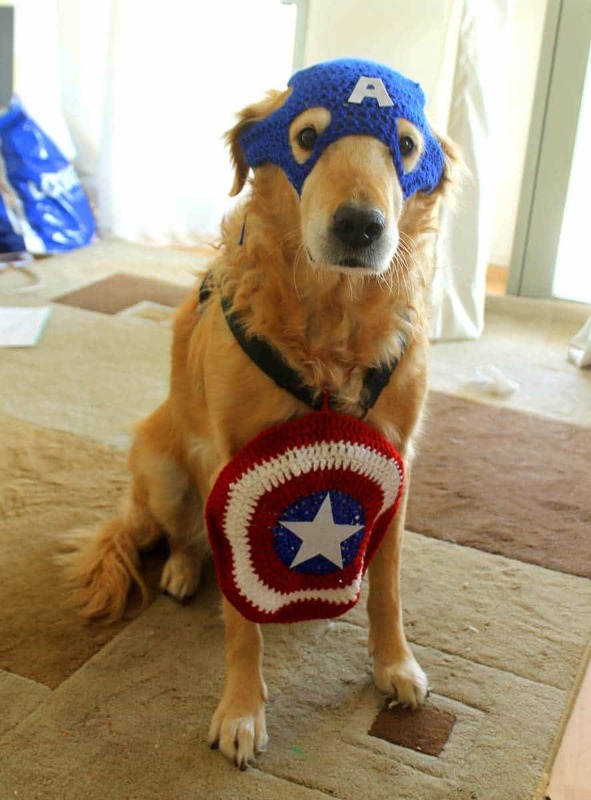 It is handmade, knitted from smooth yarns, and fits the whole of the dog’s torso. This makes it ideal for keeping pups warm. 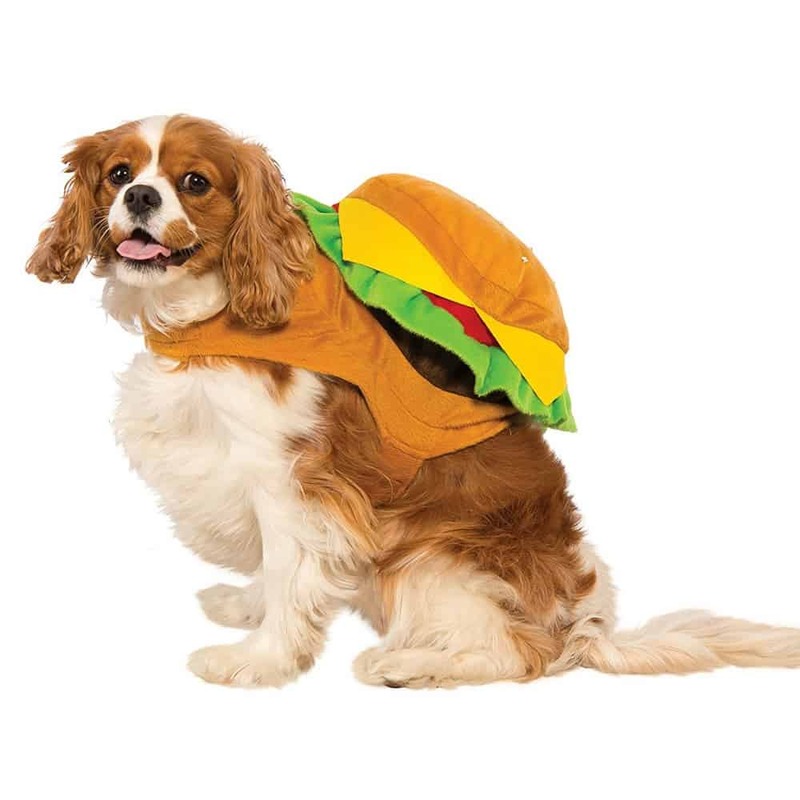 The section around the dog’s body resembles the hotdog itself, and there are two light brown stuffed buns on either side. A splash of color has been added with the addition of ketchup and mustard, also made from yarn. The sweaters are made to order, you can provide neck and chest measurements for a snug fit, and they are also hand washable. 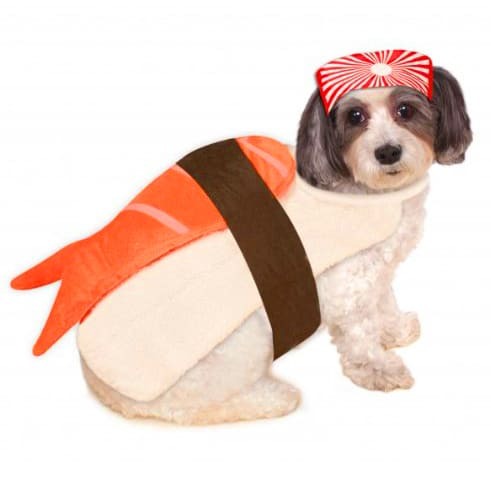 Your little hotdog will look totally delicious. 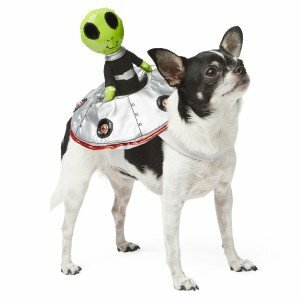 Another popular choice among small dog costumes is the classic cowboy rider outfit. 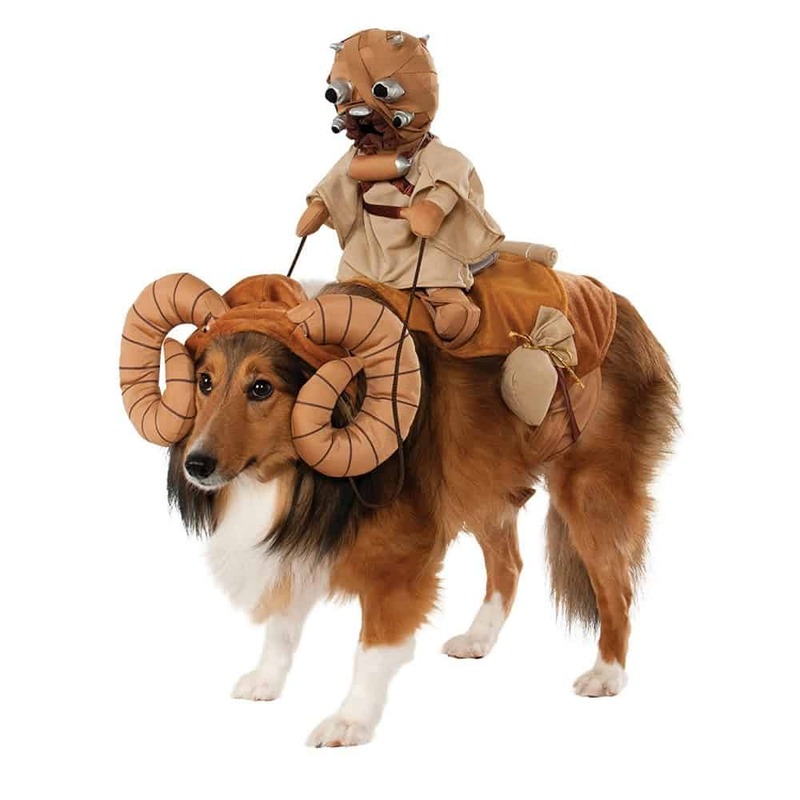 This version has a saddle, which is essentially a brown dog coat, and a cowboy attached on the back so it looks as though he is riding the dog. 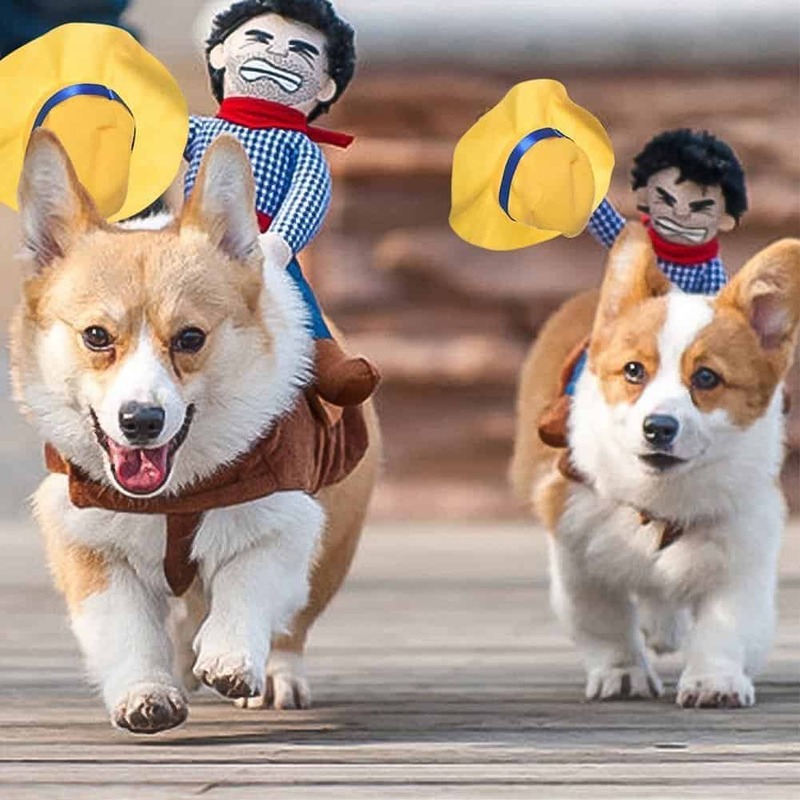 The costume is made from comfortable cotton and polyester and the cowboy is stuffed and very light. 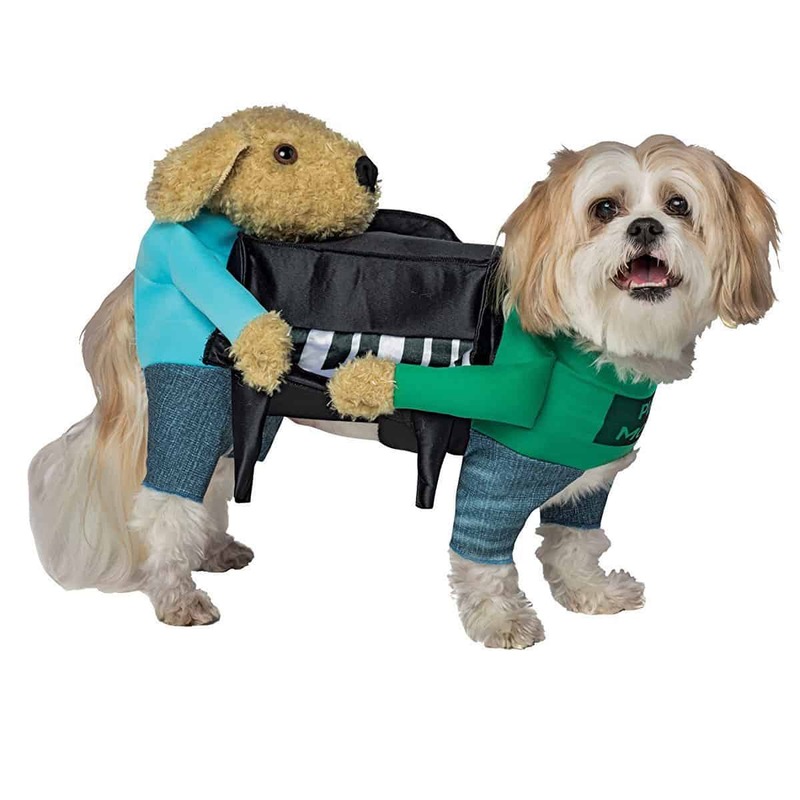 The coat is held in place with adjustable straps; there is one across the chest too, so this is perfect for small dogs with wide chest measurements that can sometimes be tricky to buy for. The cowboy waving his hat in the air and has an amusing facial expression. 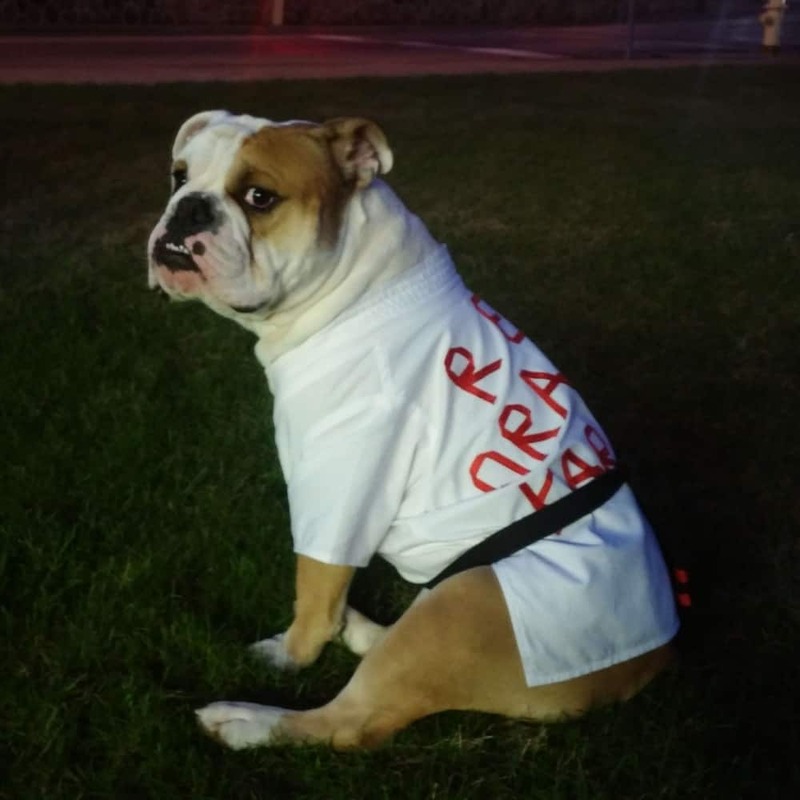 He rocks back and forth rodeo style as your dog runs. 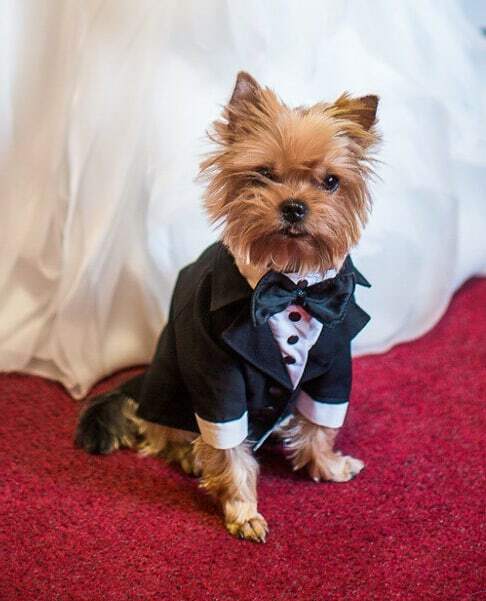 This smart suit designed for small pups is perfect for formal occasions, like christenings or weddings. 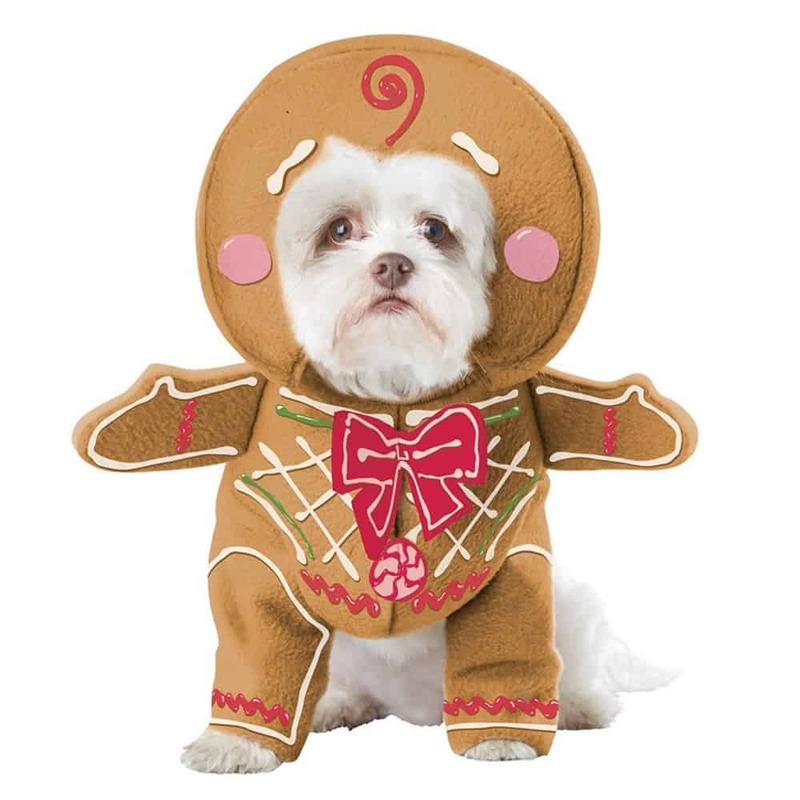 It is made to order with length, chest, and neck measurements required. This guarantees a good fit. 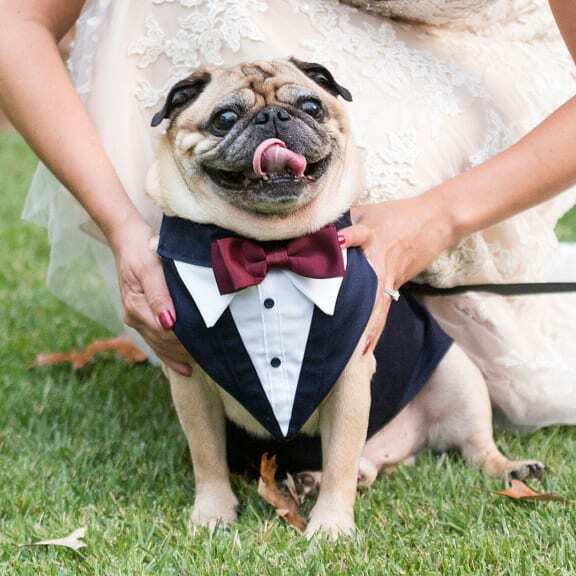 The suit includes a white shirt and black jacket made with cotton and embellished with buttons and a satin bow-tie. Other colors are available. 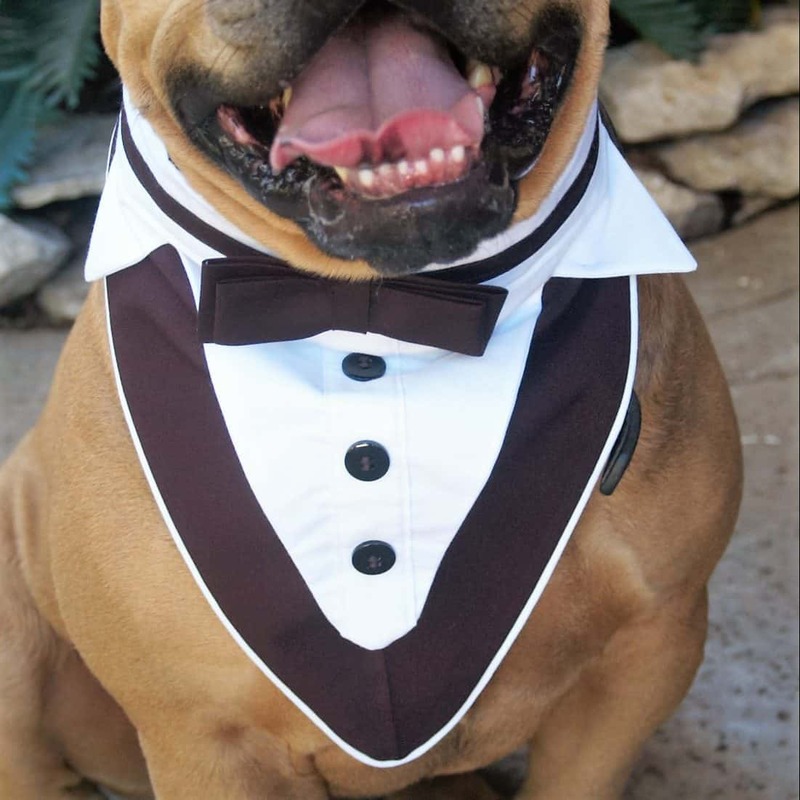 Your little dog will look very handsome and ready for an important occasion in this perfectly tailored suit. 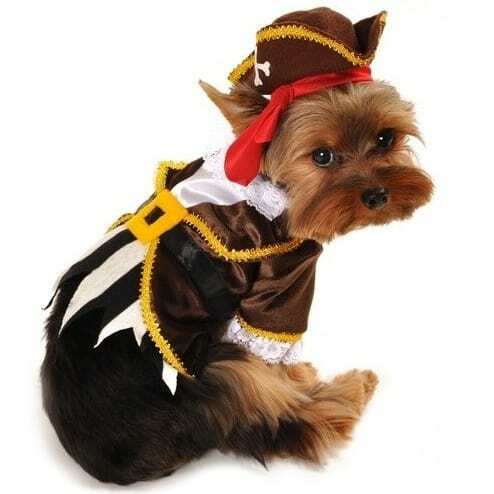 This pirate costume is carefully designed for maximum comfort. The outfit has two layers which makes it very breathable. It is a classic white shirt and brown jacket, with little stuffed arms and a hook for a hand. 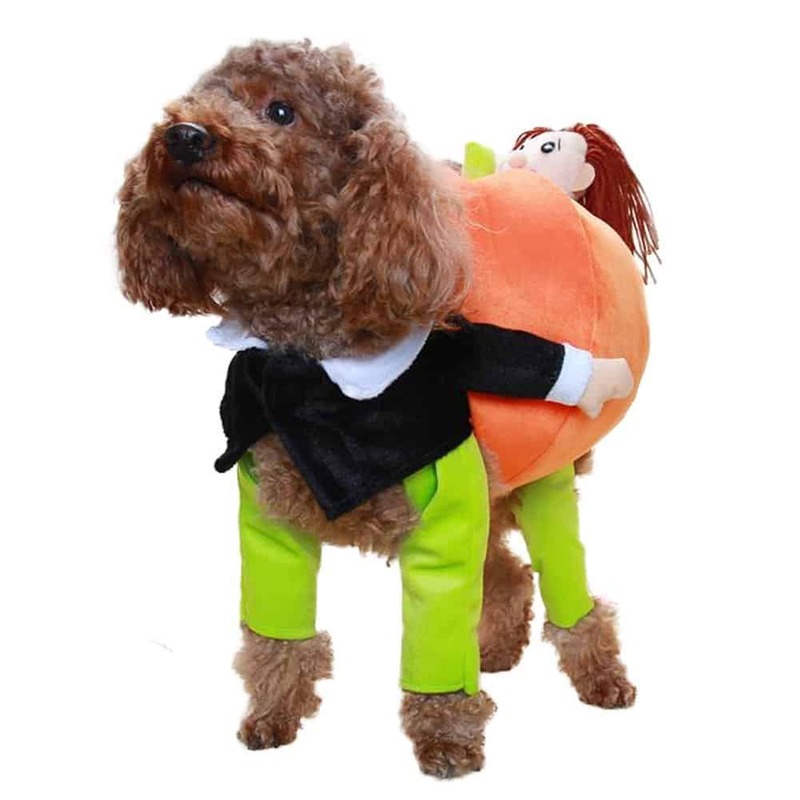 The trousers, which go over the dog’s front legs, are black. 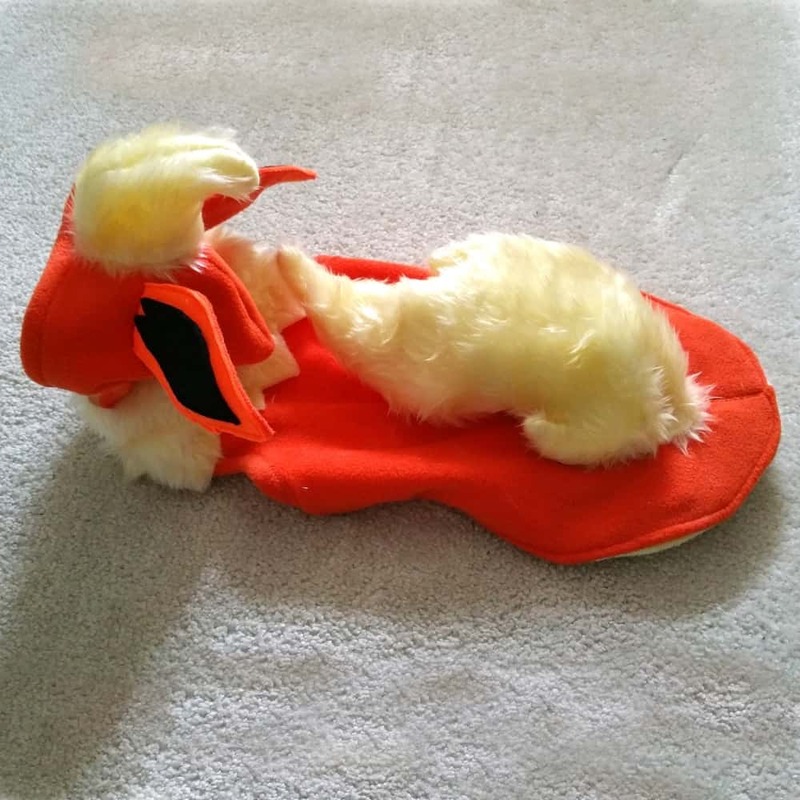 Its main section is done up easily using Velcro and the small size fits dogs that are around 12.5 inches in height and 11.5 inches around the neck. 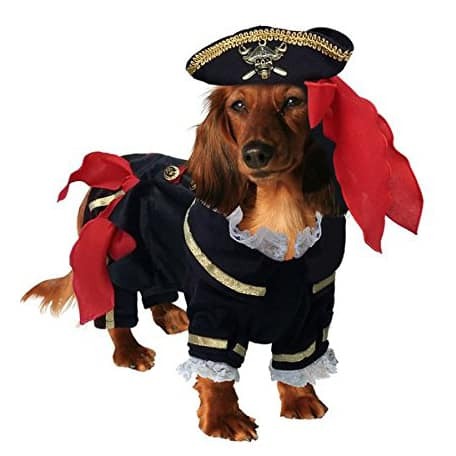 There is also a black cape, which has a drawstring tie, and a soft, adjustable Captain’s hat that can be worn over most ear types. 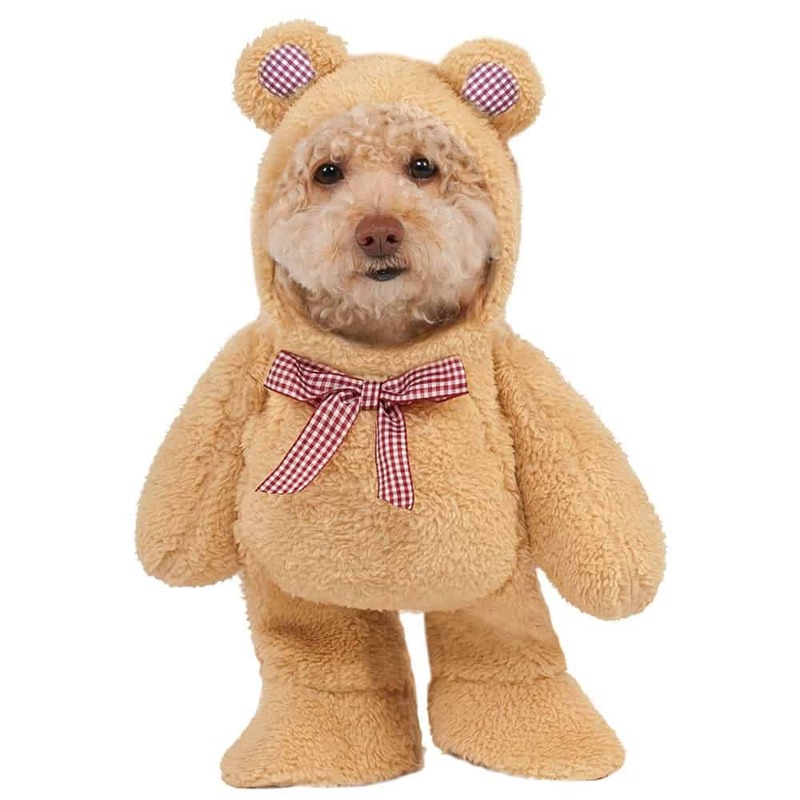 The costume is machine washable, cold setting. 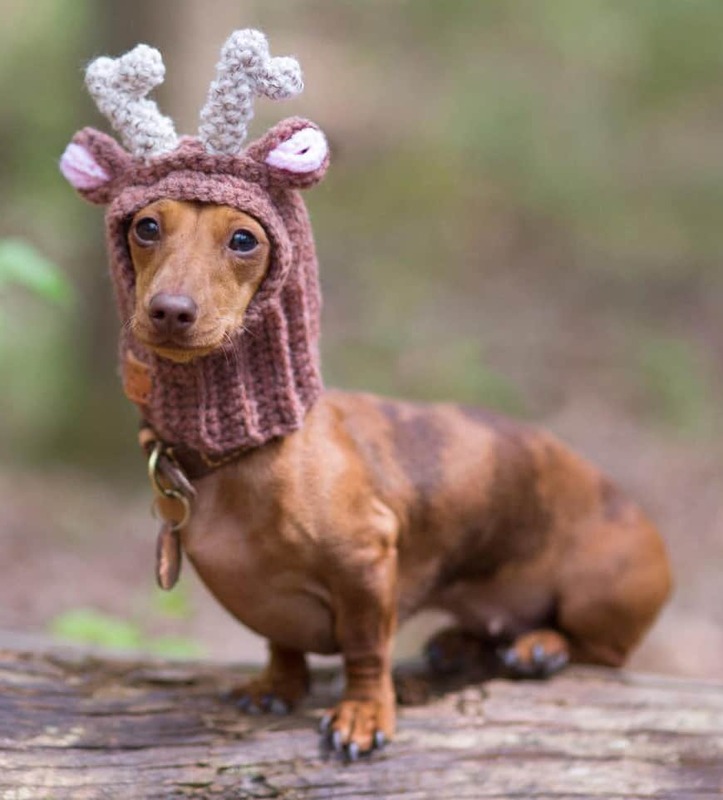 Christmas is fast approaching and your pooch may need a cozy reindeer hat to keep his little ears warm. This simple snood is crocheted by hand with soft yarns. 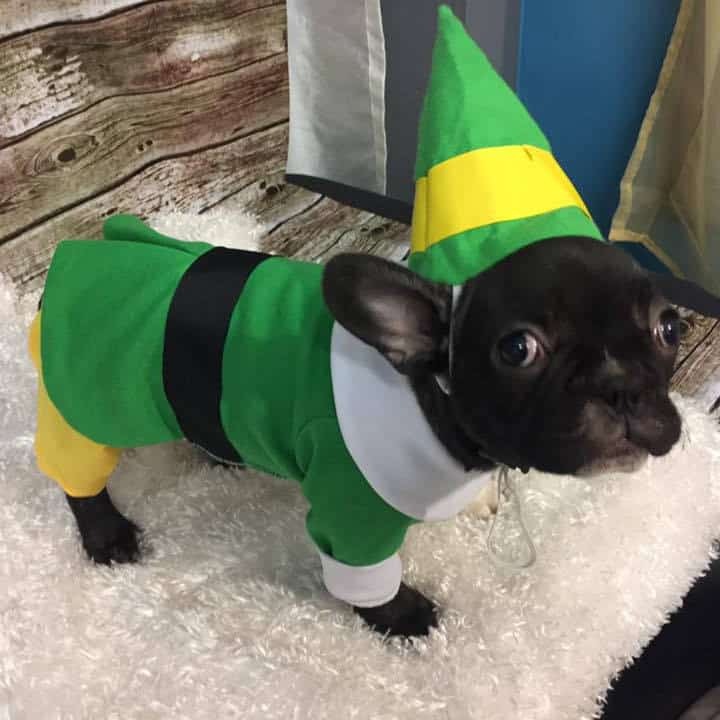 The small size fits breeds like Chihuahuas and Yorkies, and is actually quite stretchy so should be fine for most other small dogs too. 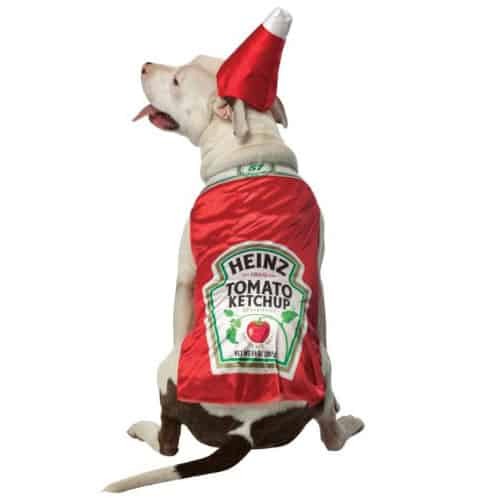 The hat slips quickly over the dog’s head and around the neck. There are little ears and antlers on the hood to make your dog look like a real reindeer. This hat is perfect for winter walks and of course Christmas day. 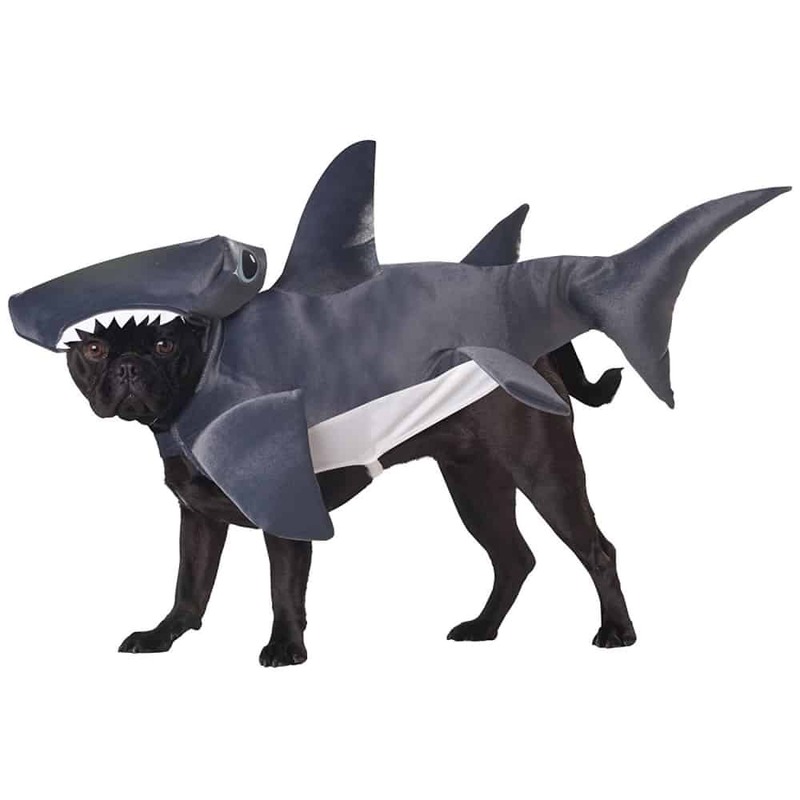 There are certain considerations to be made when choosing large dog costumes. 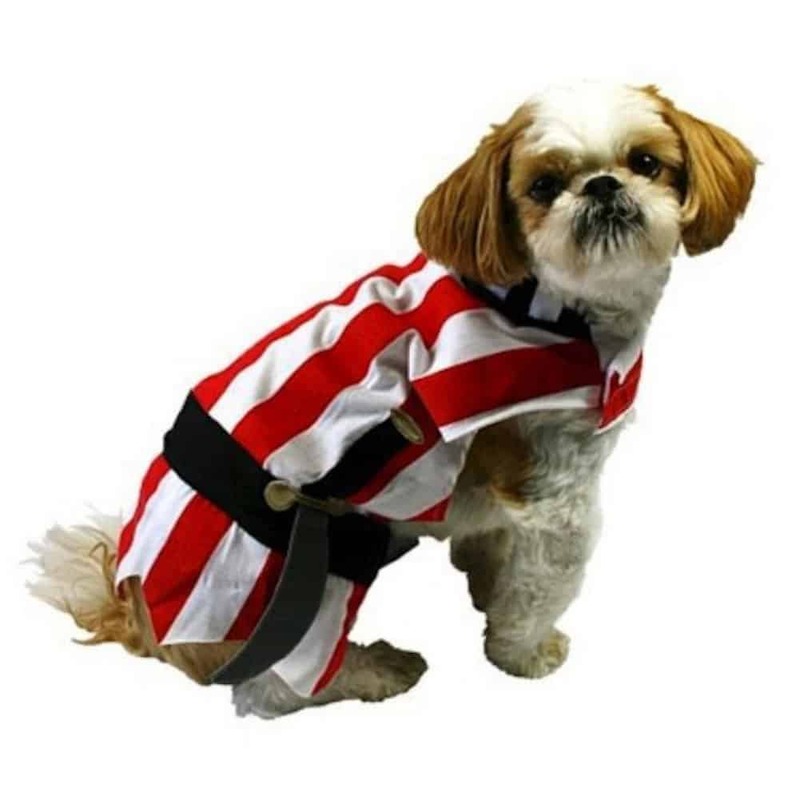 Of course, you want your pooch to be comfortable, so it is important to think about the fit. 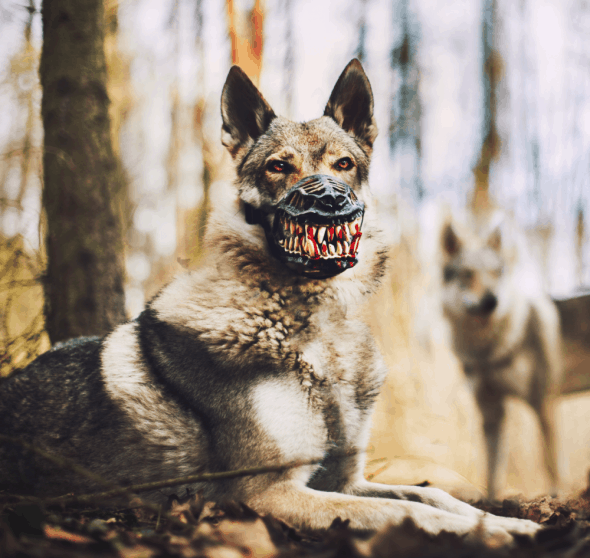 Keep in mind the wide range of breeds classed as large dogs, from Golden Retrievers to Collies, and even Greyhounds. 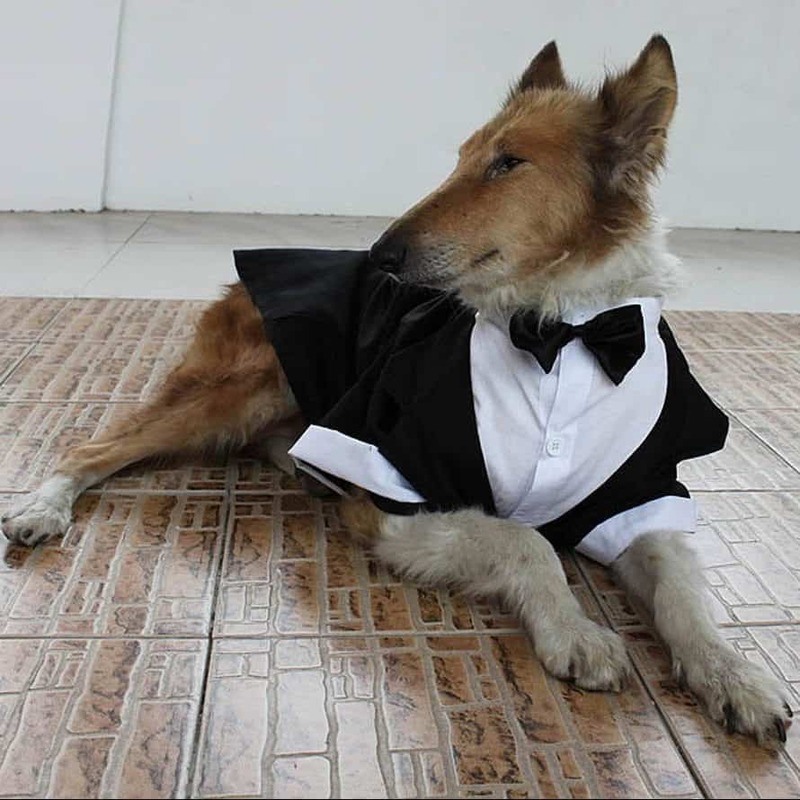 Despite being similar in height, these dogs all have very different body types. 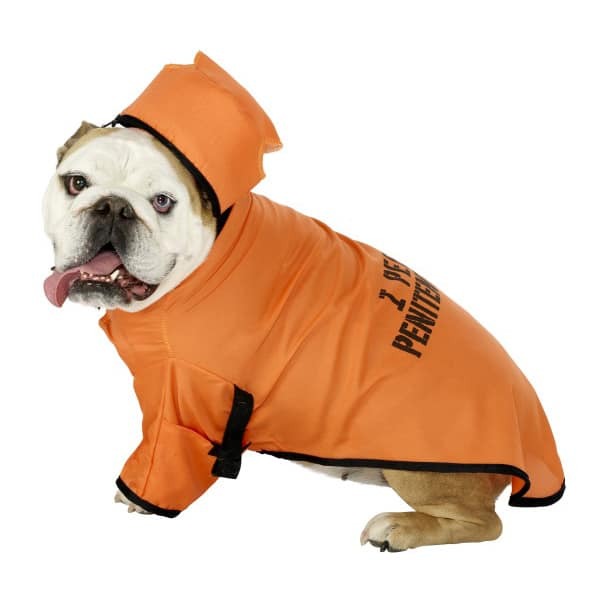 Not only this, but it is worth also bearing in mind the personality of your pooch. 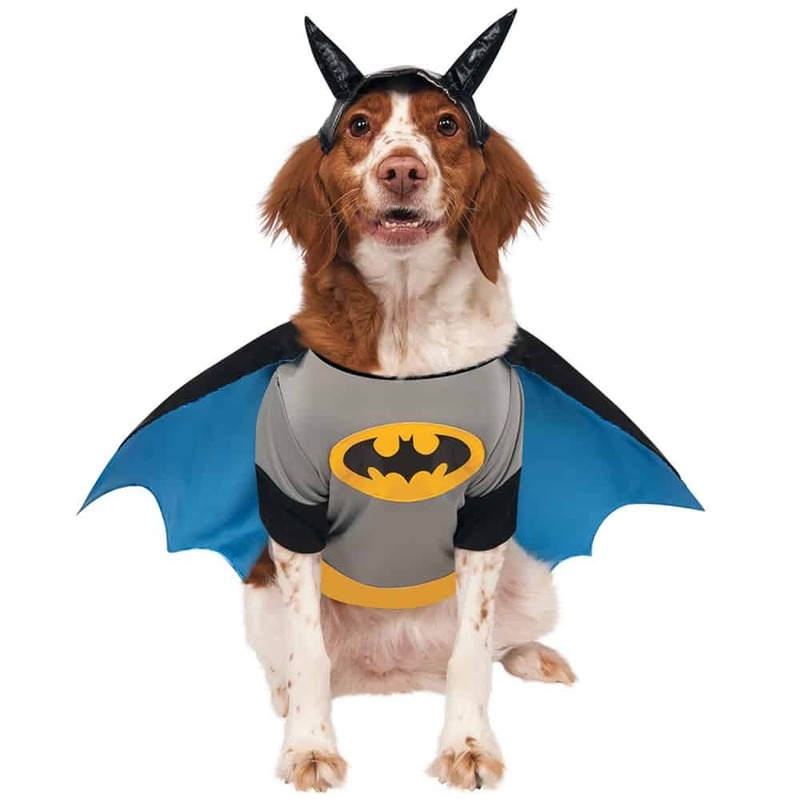 Are they content to laze around in something comfortable, or do they have boundless energy and need large dog costumes that are durable and easy to move around in? This section is dedicated to costumes for all those on the larger side. 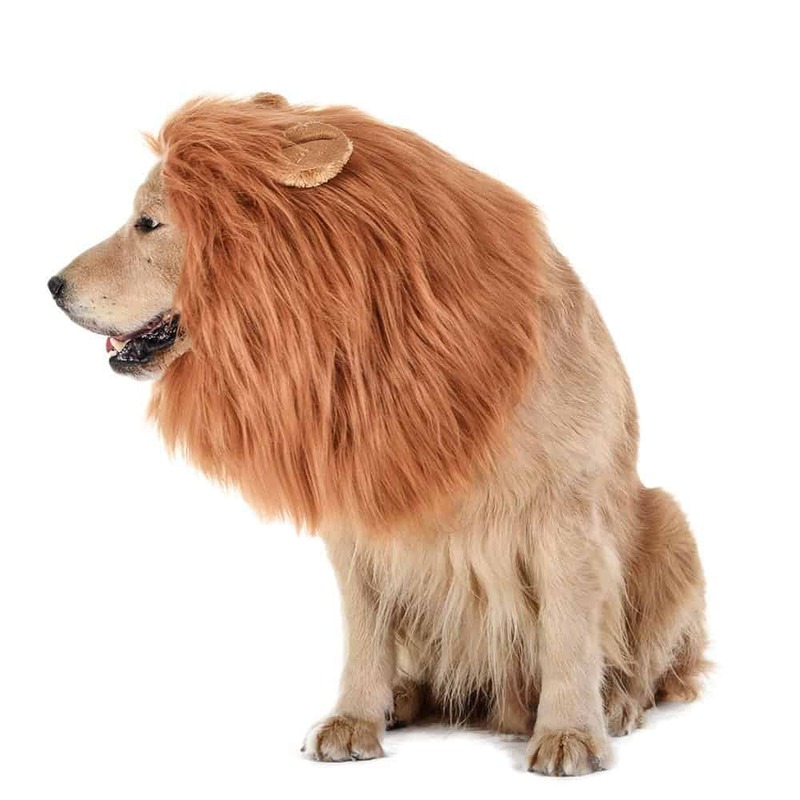 First up in the large dog costumes category is a hood that resembles a lion’s mane. 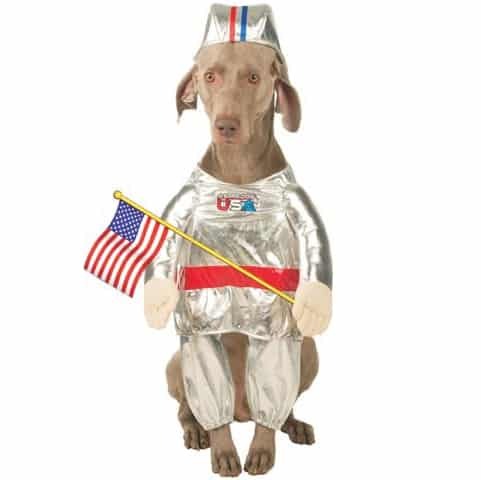 This is a simple but effective costume if you have a dog with a light brown or golden coat, for example a Vizsla. 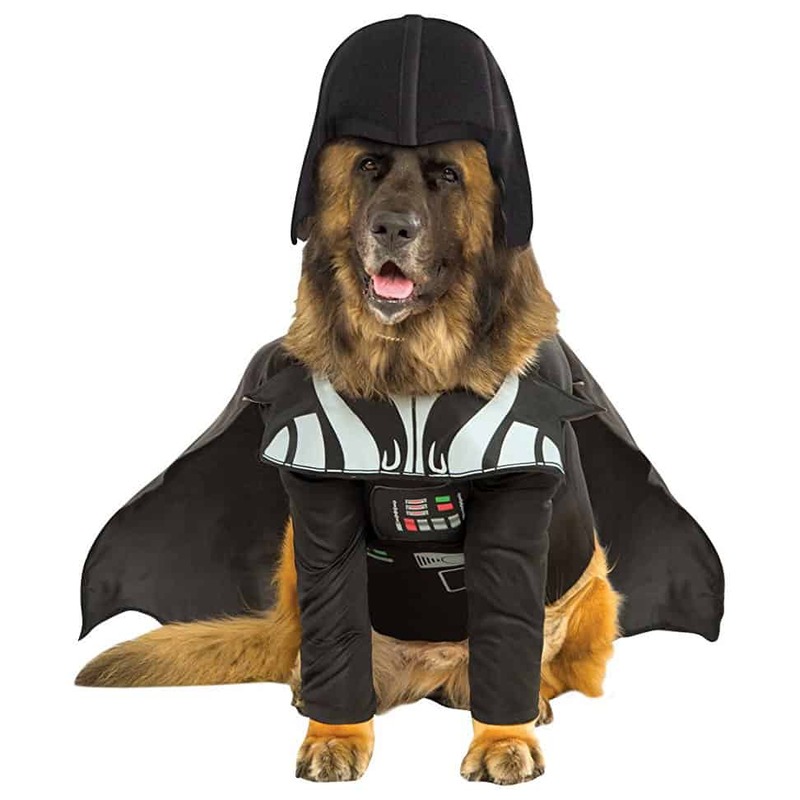 The hood sits comfortably around the dog’s ears and neck. 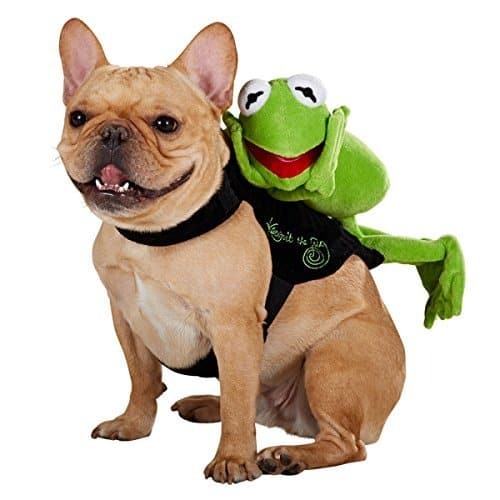 It fits dogs with a neck size of 60-80cm, and is held in place with an adjustable elastic band. Made from wool, and very easy to clean, this mane can be worn outdoors too. 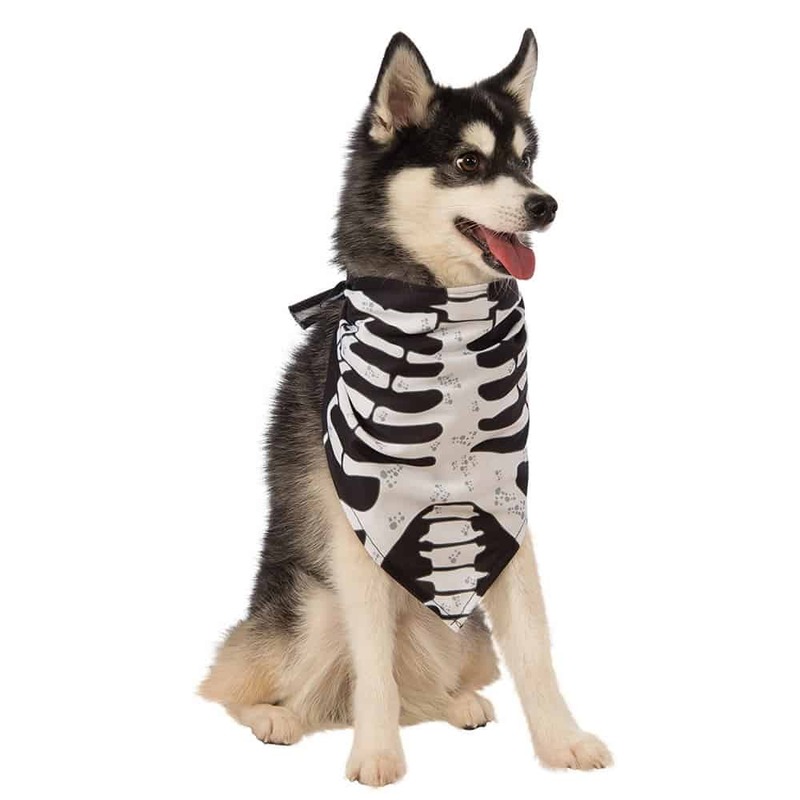 Perfect for dog Halloween costumes, or if you fancy having a funny conversation starter for your daily dog walk. 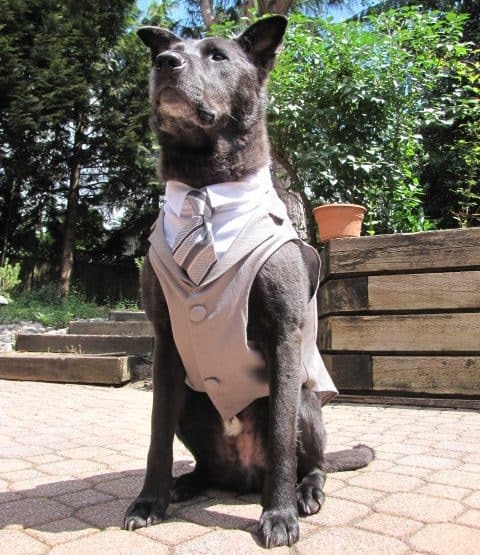 If you need a formal outfit for a big dog, this tuxedo could be an excellent choice. 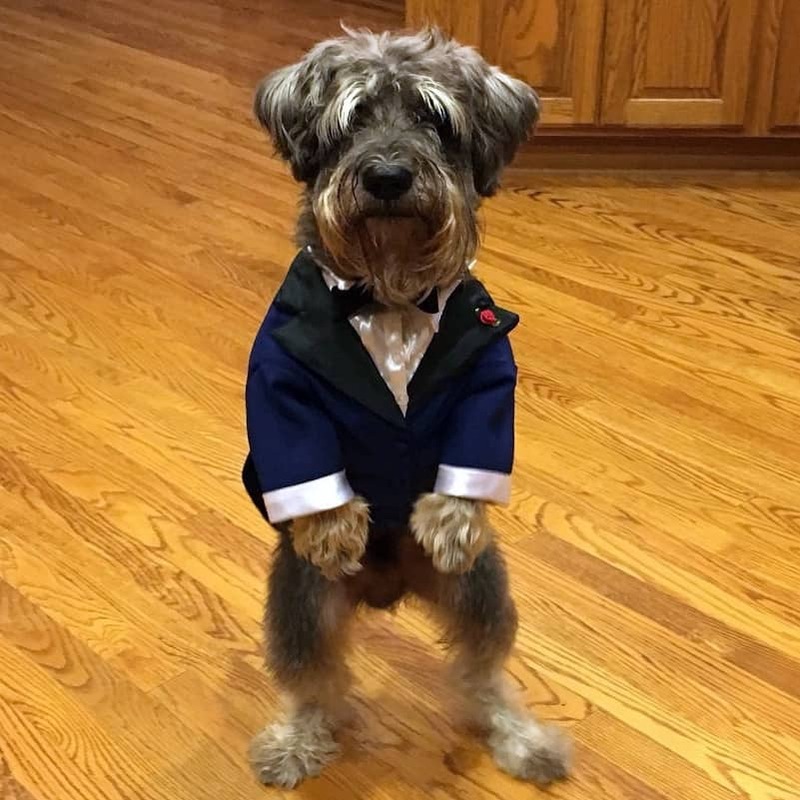 Each tuxedo is made to order and you can provide your pup’s exact measurements for the best possible fit, especially since most xl dog costumes are usually too loose. It can be created in a light gray fabric, with an undershirt in white. 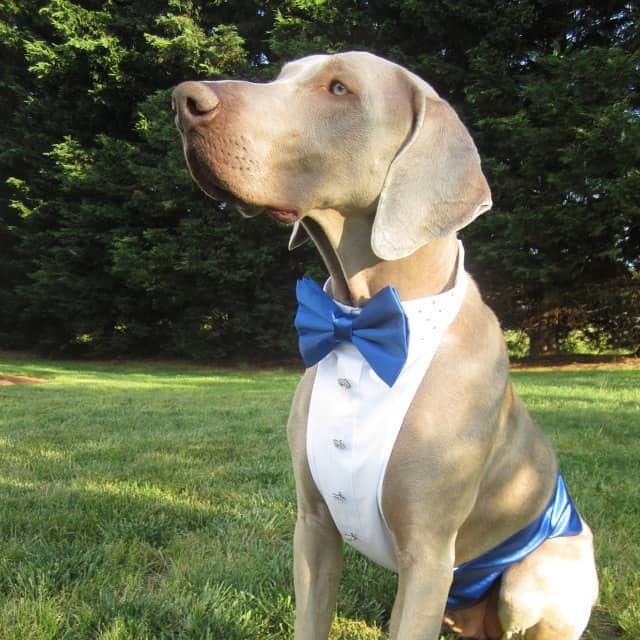 It looks particularly handsome on dogs with gray or dark coats, for example a Weimaraner or a Giant Schnauzer. 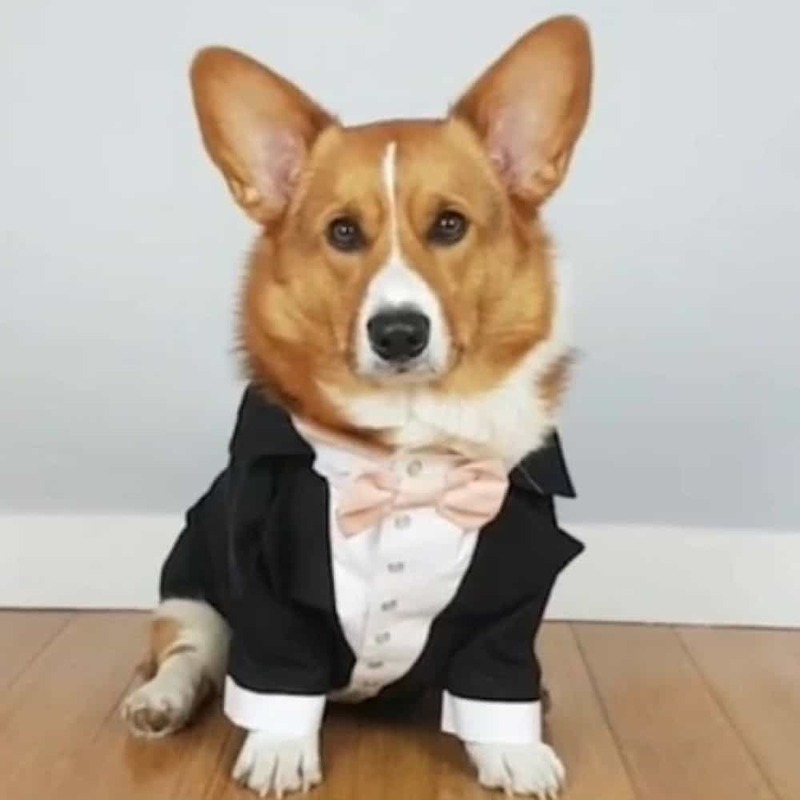 The tuxedo is also available in different colors that may match other fur types better. 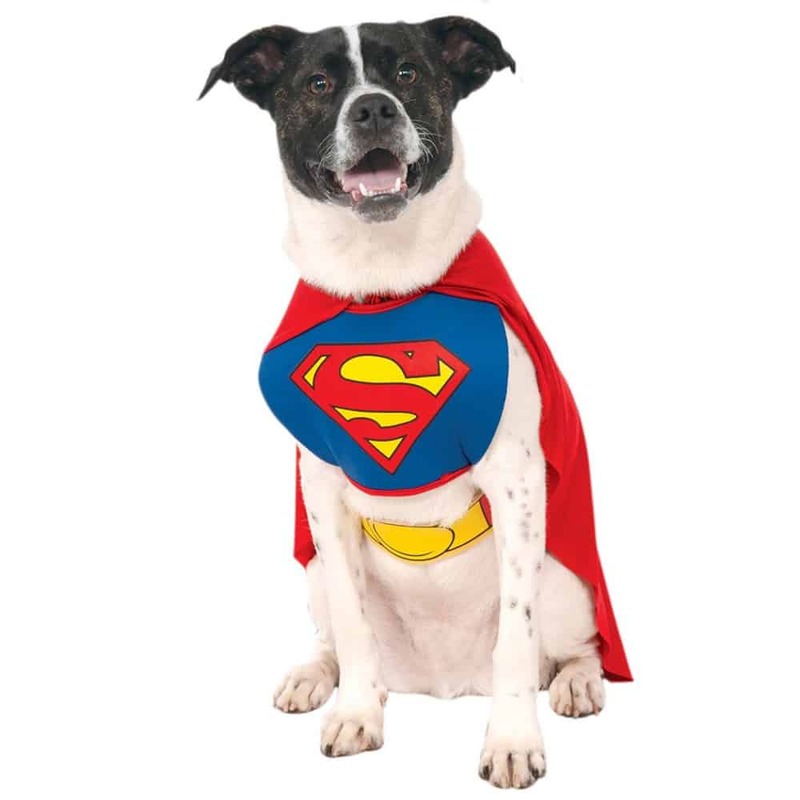 It is made from soft, pliable materials, including spandex cotton, and is very comfortable to wear. There are two decorative buttons on the jacket, but the whole tuxedo is actually fastened quickly with Velcro. 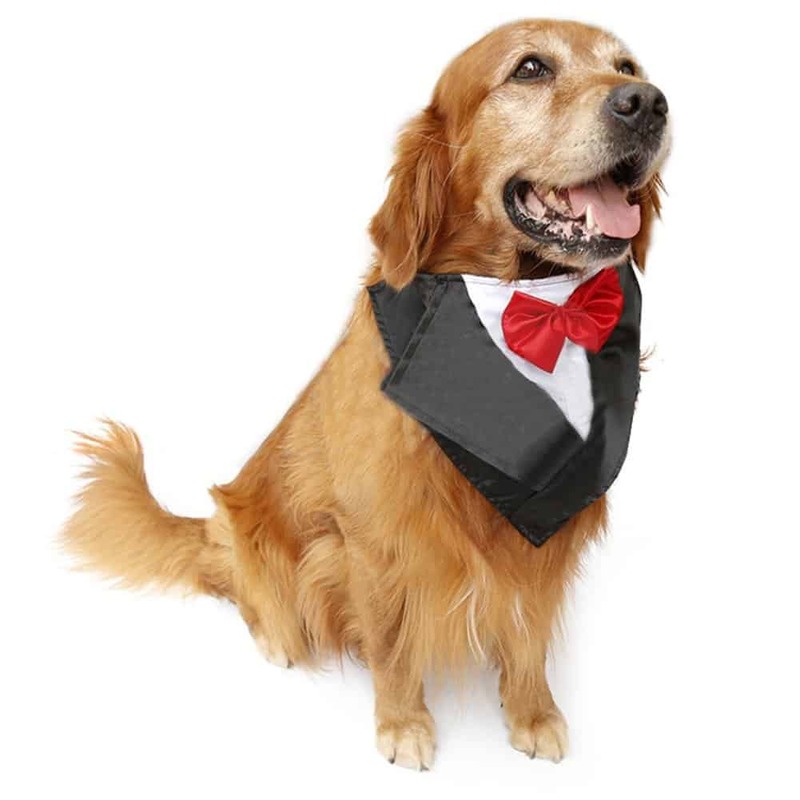 But before ordering, please note that the tie is not included. 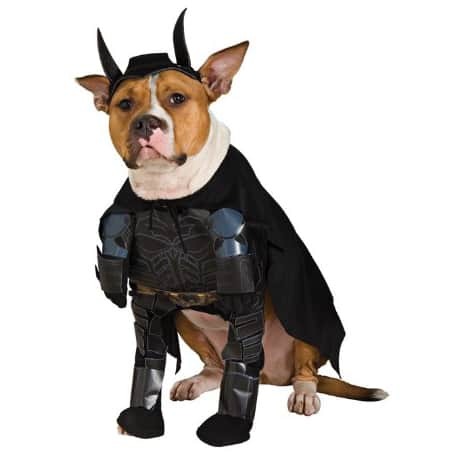 Are you looking for Movie themed Halloween pet costumes? 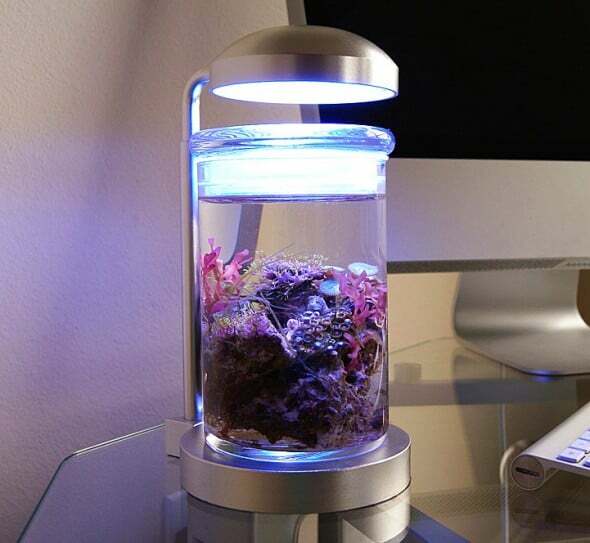 Well, this quirky creation could be a wonderful inspiration. 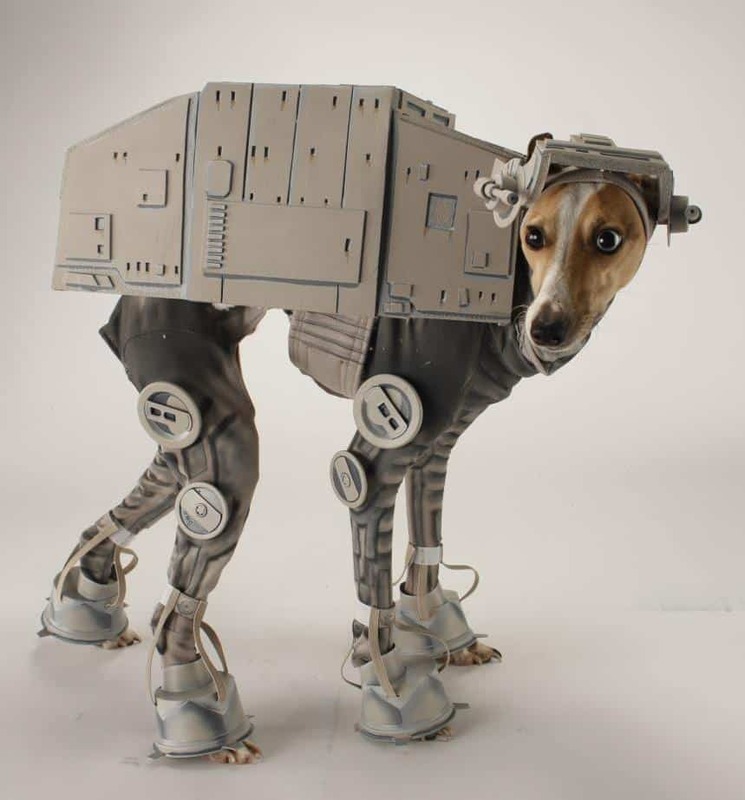 It is designed to make your pooch look like the All Terrain Armored Transport (AT-AT) walker from Star Wars. The costume appears to be fashioned from cardboard boxes and some kind of stretchy spandex material for the body suit. 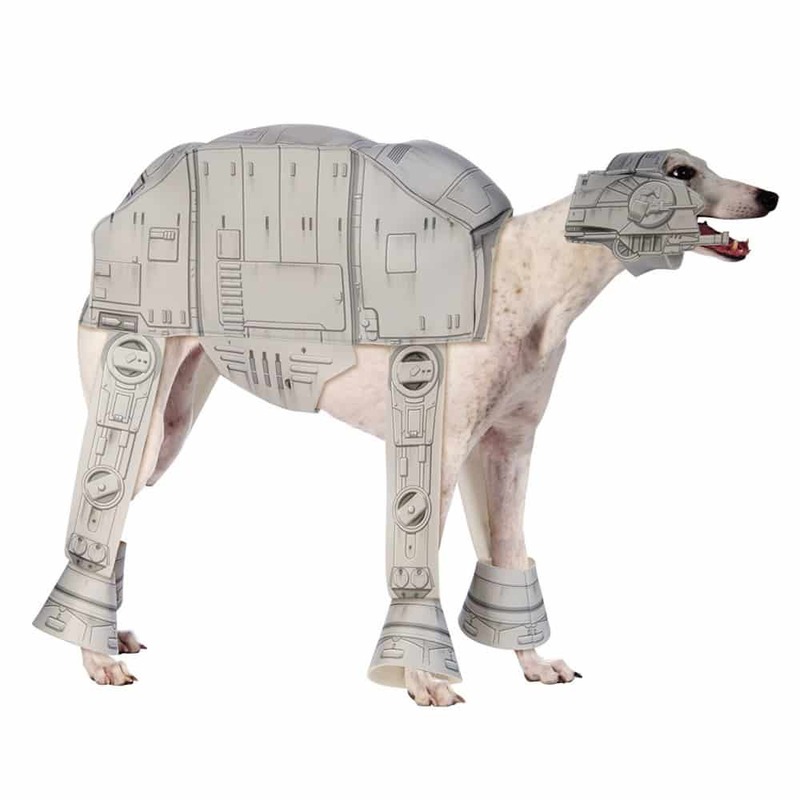 It is being modelled by an Italian Greyhound, so may need to do some slight adjustments if you have a thicker dog. You may also want to consider your dog’s temperament; there are probably some that wouldn’t enjoy wearing a cardboard box strapped to their back and could destroy the whole thing in minutes! 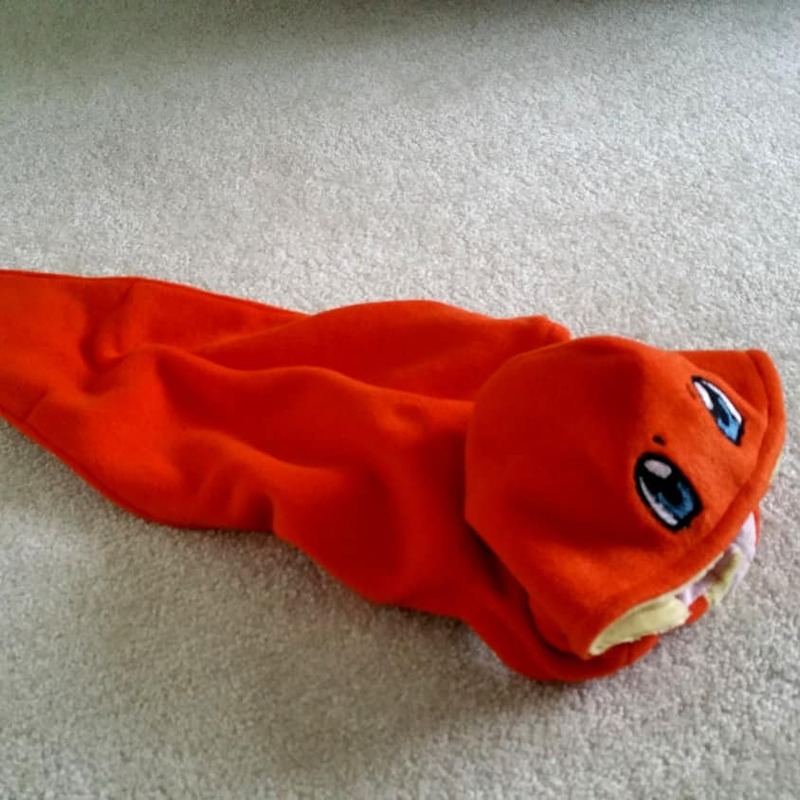 For more docile creatures, this is a fun homemade outfit. 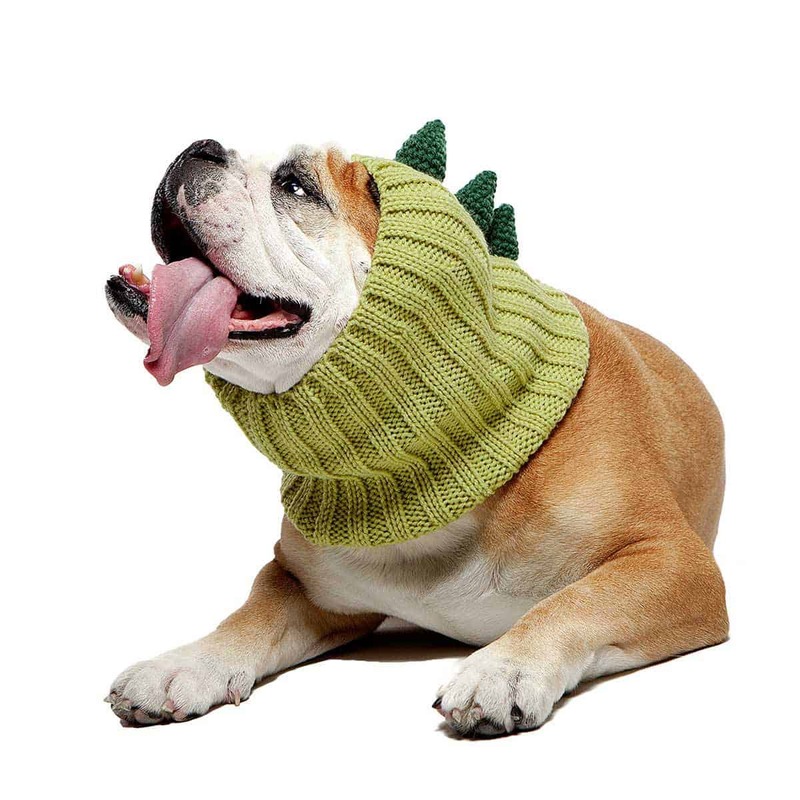 A dinosaur snood can be a great accessory that can be added on large dog costumes or to just keep your pet’s ears and neck warm on winter walks. It is handmade and has been crocheted with 100% acrylic yarn. 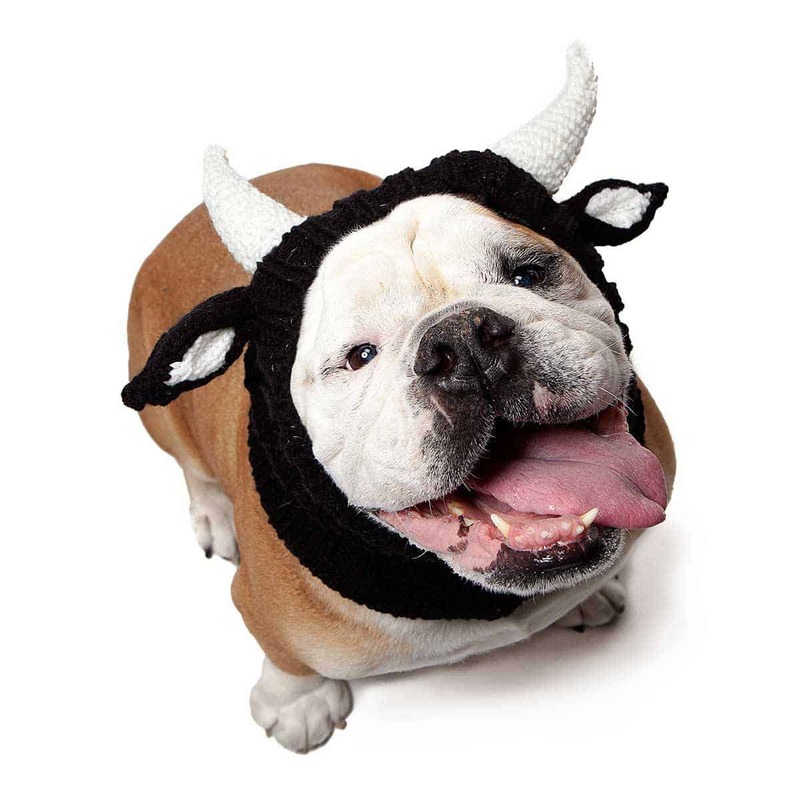 The soft and stretchy design means that it is very easy and snuggly for dogs to wear, even for those with a larger neck size like Bulldogs or Boxers. This piece is light green with a darker shade of green used for the dinosaur spikes. 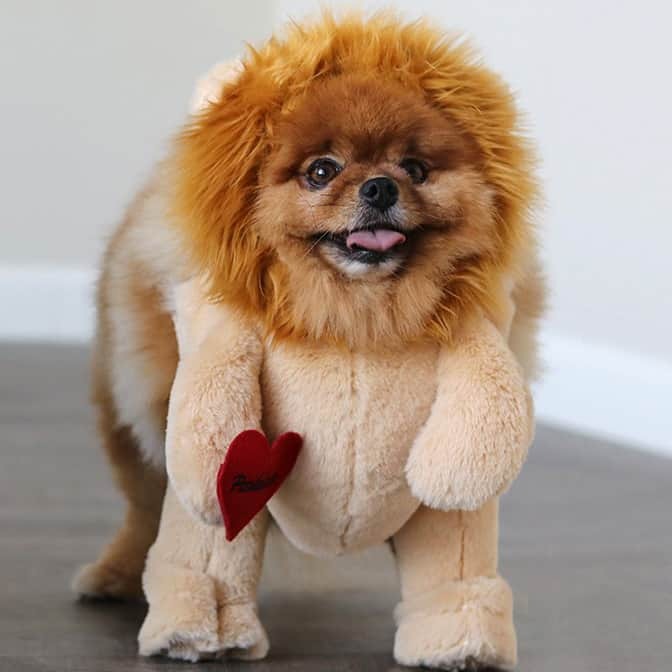 The overall effect is one of fierce cuteness. 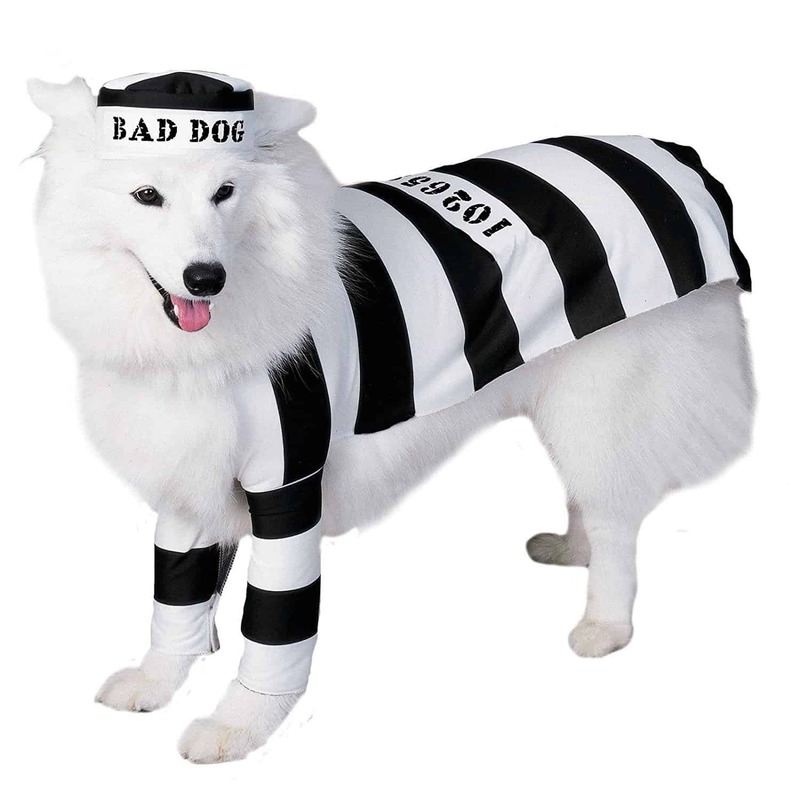 If your dog is a bit of a trouble maker, a prison pooch costume could be a good fit. 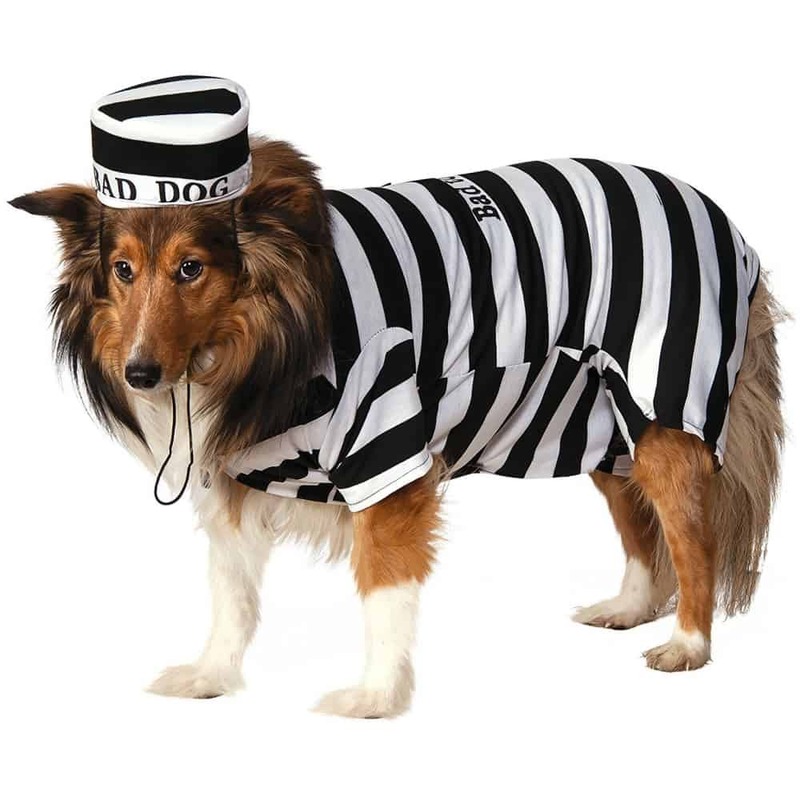 This outfit’s design consists of the old black and white striped prisoner shirt which is made from polyester and cotton, and fastens easily with Velcro. The shirt is soft and loose fitting so movement is not inhibited. There is also a matching hat included which is held in place with an elastic band. 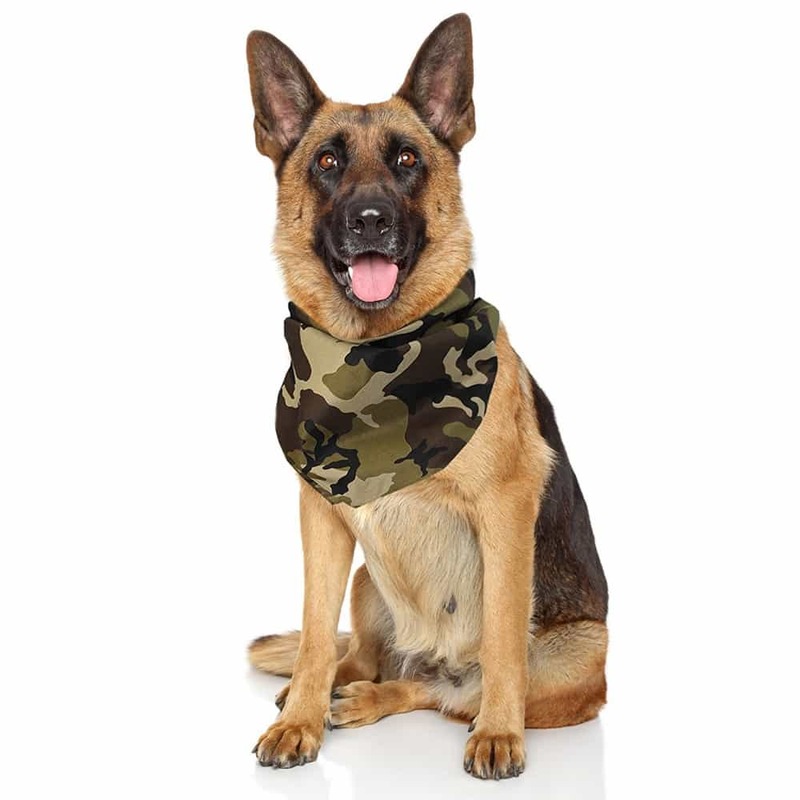 The xxl size measures 24 inches in length and is recommended for Great Danes, Bullmastiffs, and St Bernard breeds. There are other large sizes available, including xl and large. 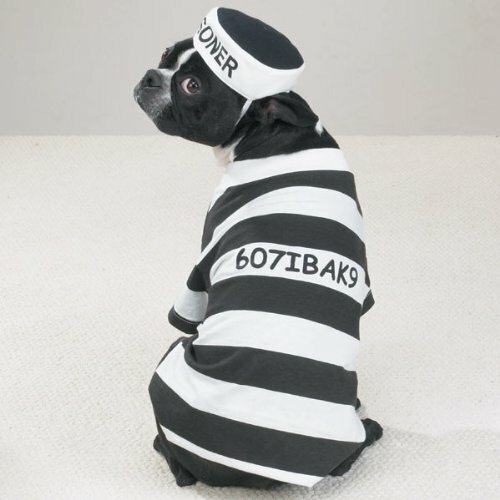 No matter his crime, you won’t be able to stay mad at your pup when he is wearing this hilarious getup. 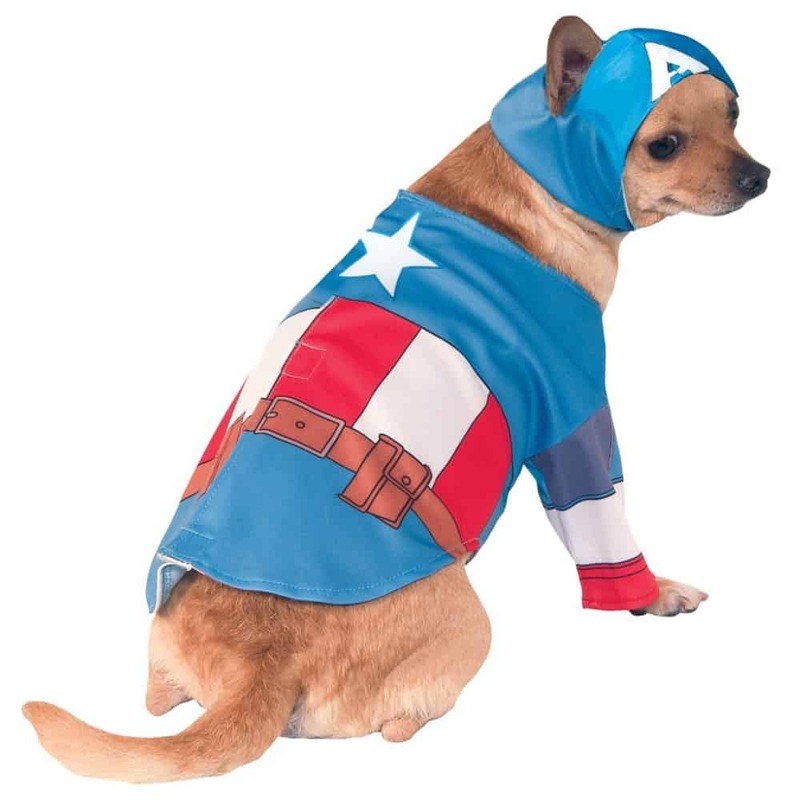 When it comes to large dog costumes superhero outfits are always popular, and this Captain America mask and shield is no different. Both are made from soft acrylic yarns, with felt accents added. 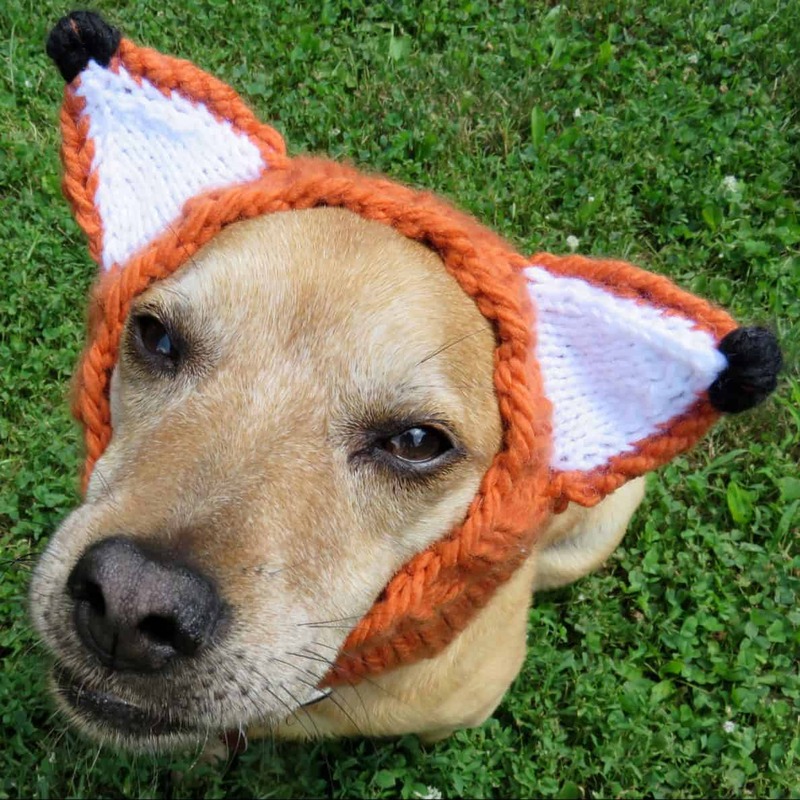 The mask fits dogs with an ear to ear measurement of about 6-7 inches and approximately 11.5 inches around the muzzle. 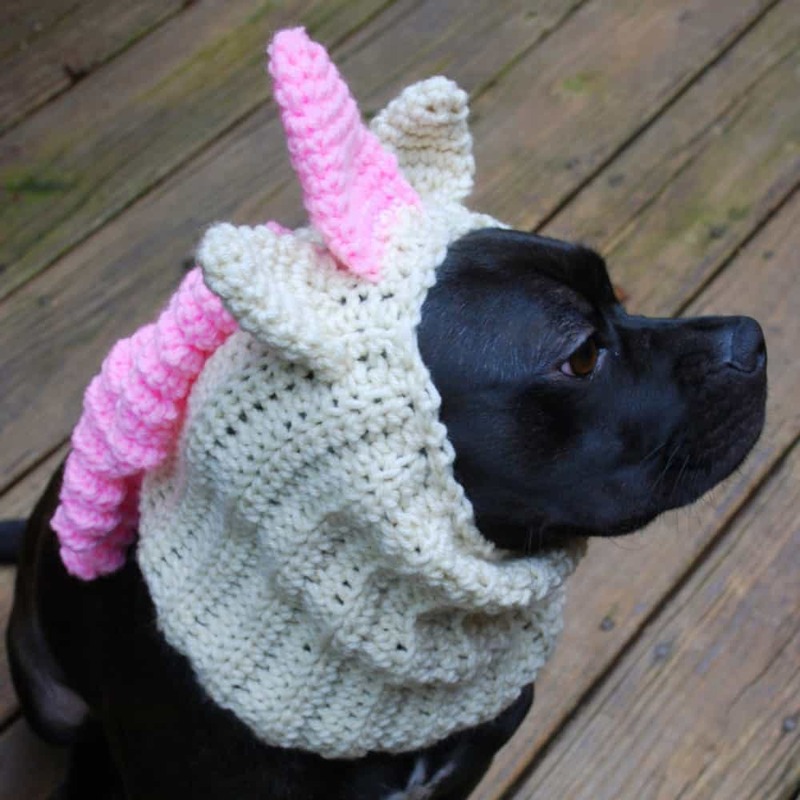 It does fit better on dogs with a longer snout. There is the option to provide custom measurements if you are concerned about the sizing. The shield is fastened effortlessly around the neck, or attached to the collar. 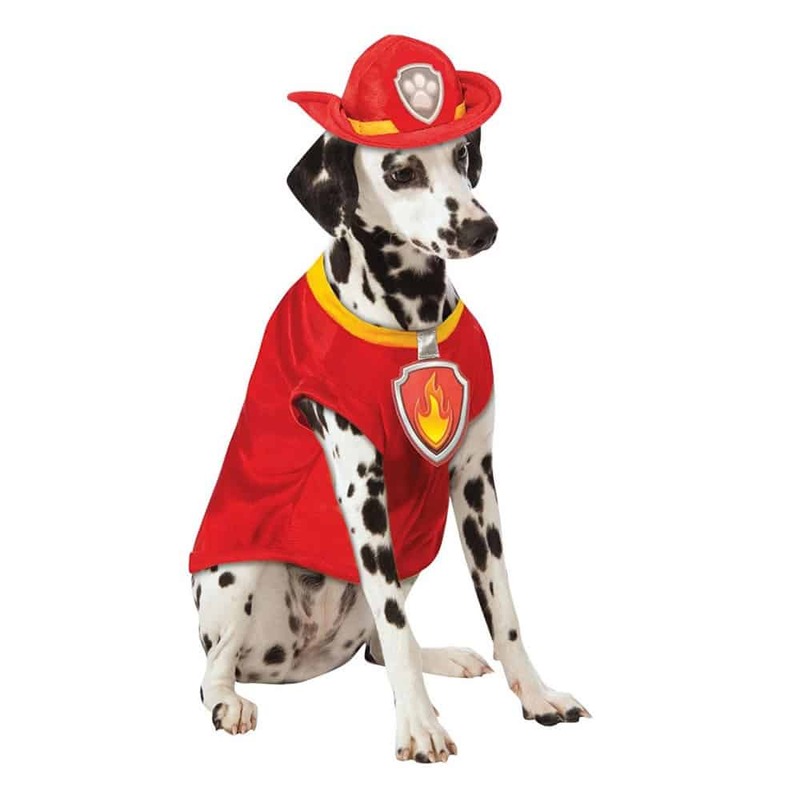 Bright colours make this costume pop and your sidekick will look like he just saved the day. 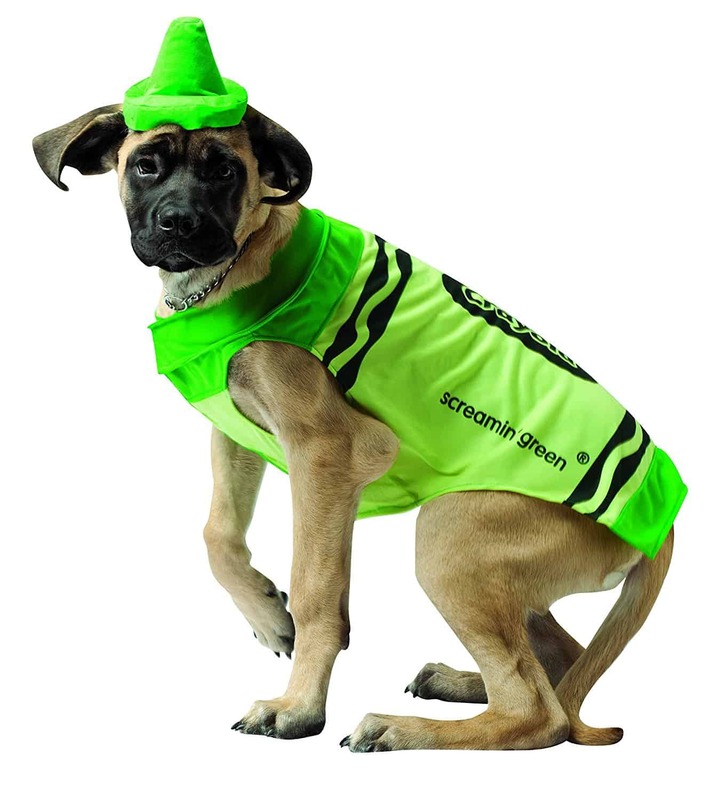 This green Crayola costume in extra-large will be great for pups with bright personalities. 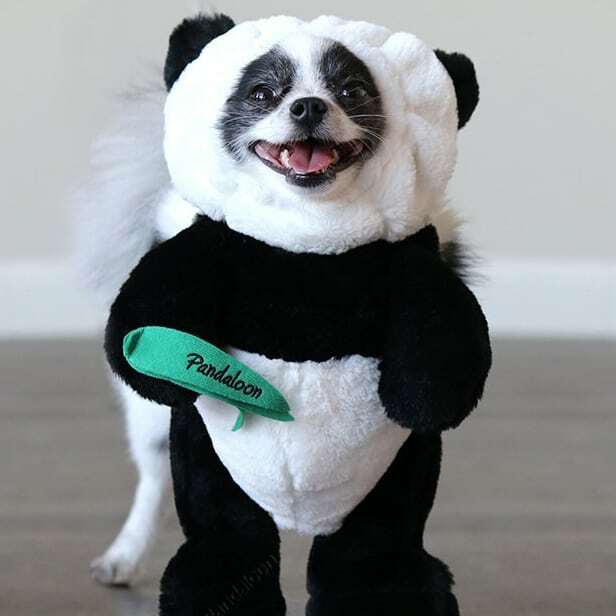 The costume is made from polyester and is designed in the shape of a traditional dog coat, meaning your pup can easily move and run around as normal. A Crayola pattern is printed on the bright green coat, so it is clearly supposed to be a crayon. 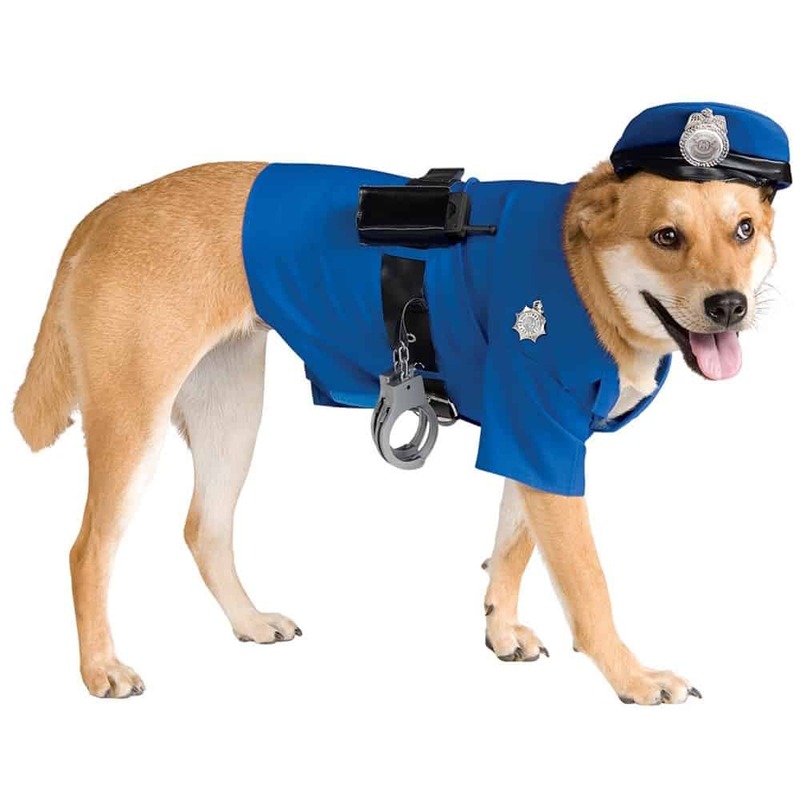 The costume comes with a hat, which forms the tip and is secured with an elastic band. 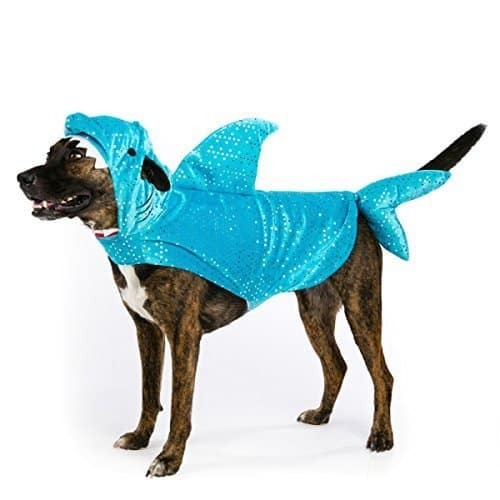 Definitely a funny and colourful addition to your big dog costumes collection. 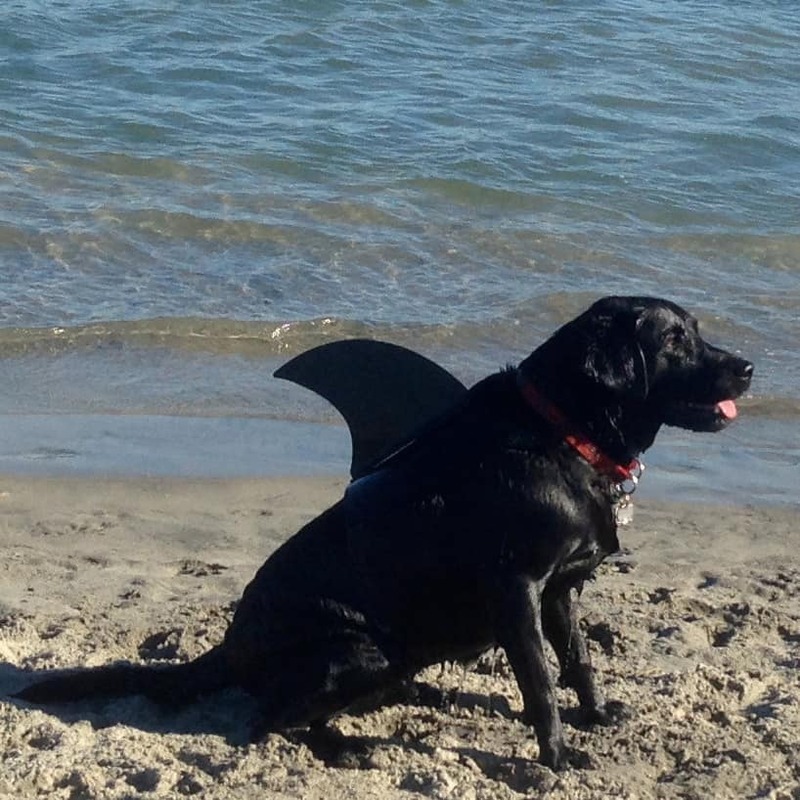 The shark fin has been designed with a Labrador in mind, but would still work well for other large dog breeds. 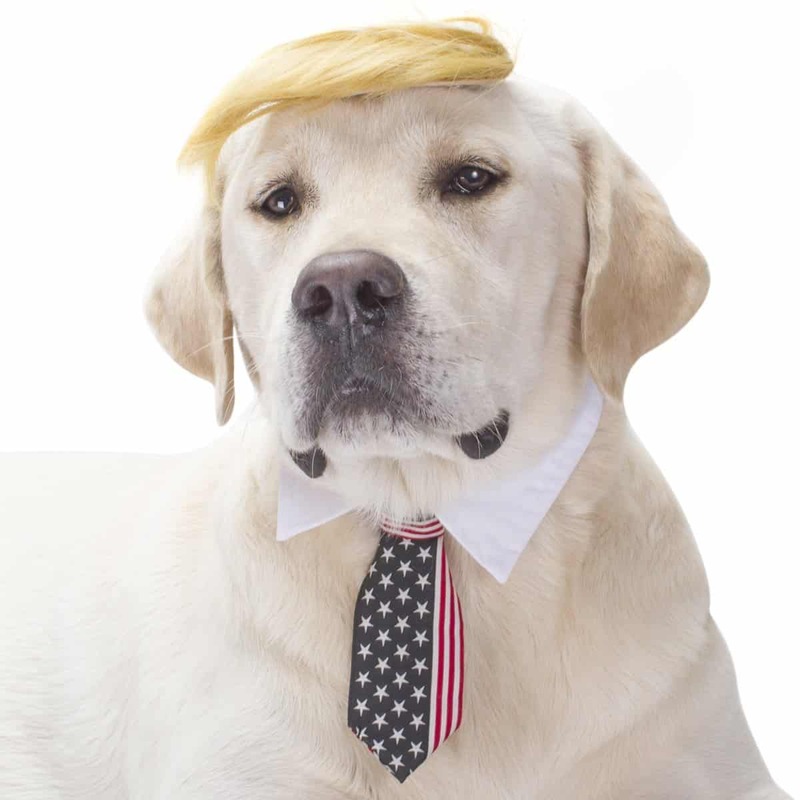 It is available in a variety of colors, with the idea being to get one that matches your dog’s fur, so it looks as real as possible. 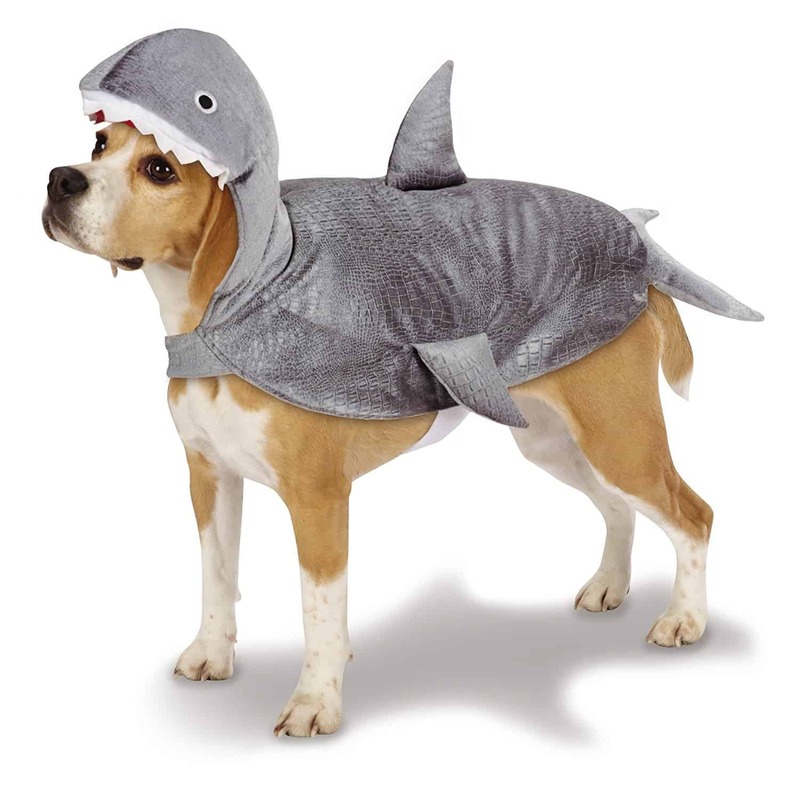 The fin itself is made of light weight rigid plastic so it is not heavy for dogs to carry. 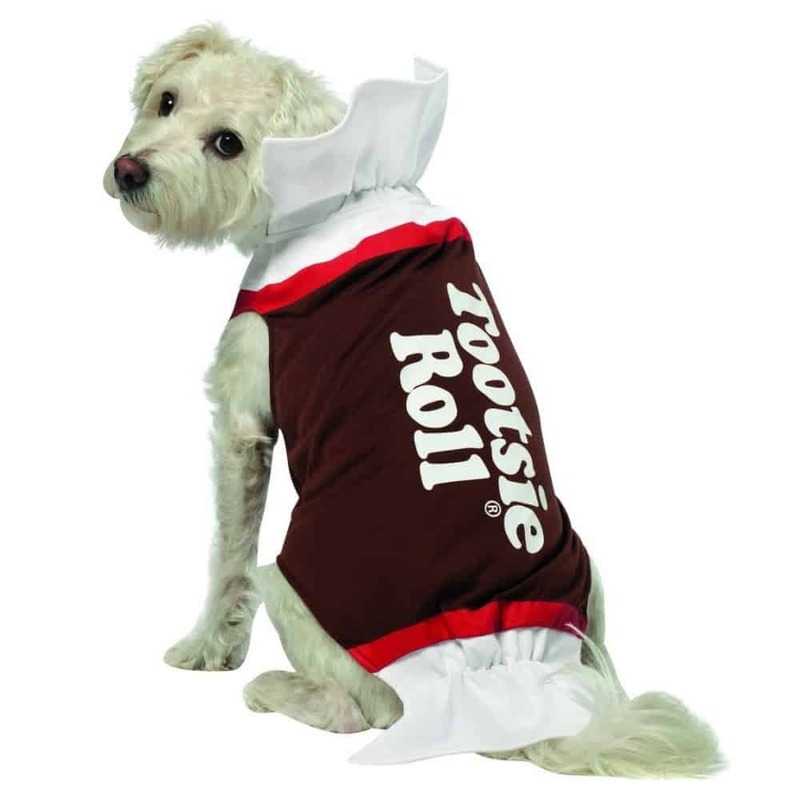 Straps fasten around the belly and are adjustable, the large size fits most dogs over 50 pounds. 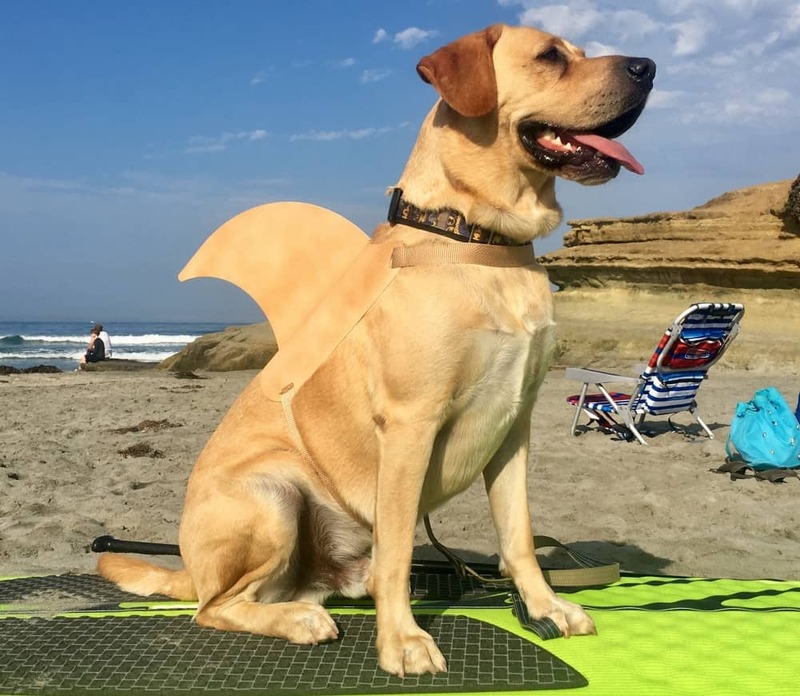 Large dog costumes often need to be durable and made for adventurous pups; this is the perfect example that can even be worn when swimming. Does your dog sit by the door everyday waiting for the delivery man? Maybe you should consider a UPS costume. 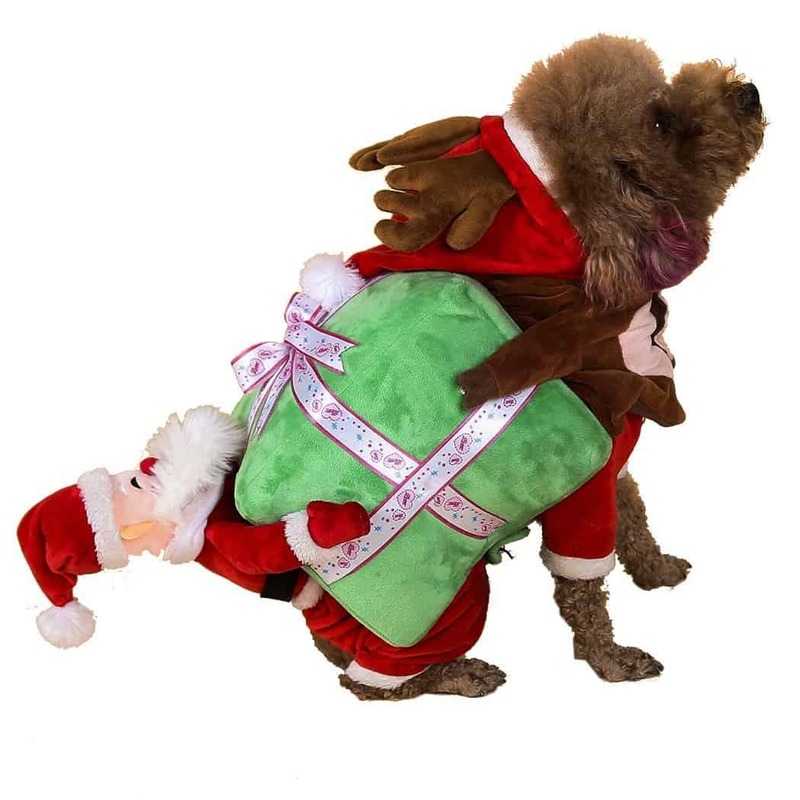 This outfit involves a shirt, in traditional UPS brown and yellow, with a set of stuffed arms that sit across the dog’s chest holding a toy parcel. 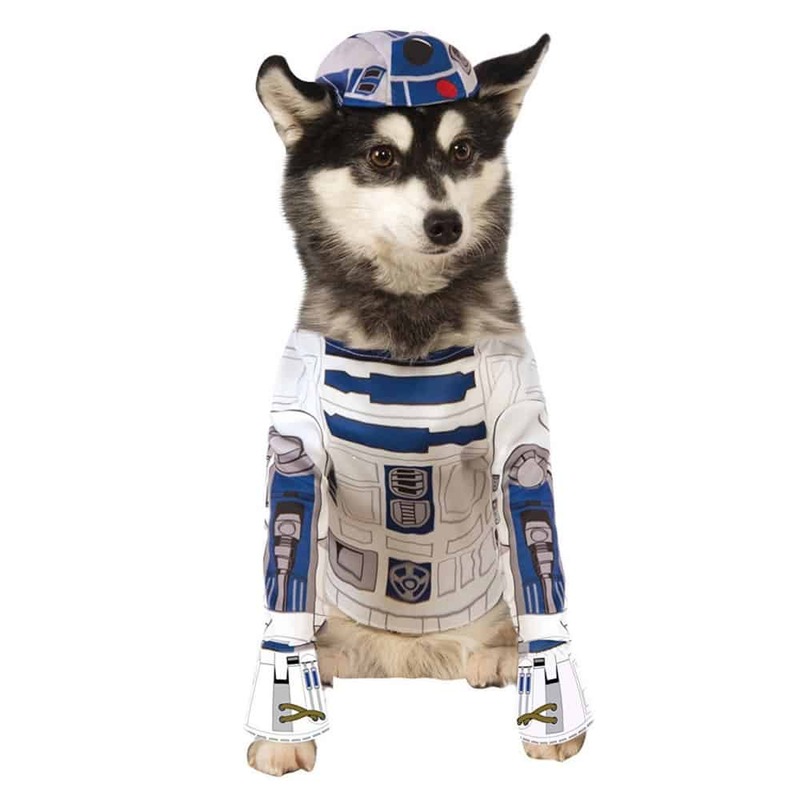 The shirt has long sleeves for the dog’s front legs and fastens behind the neck with Velcro. There is also a UPS hat included which has an elasticated strap. The outfit is made from soft polyester fabrics for maximum comfort. 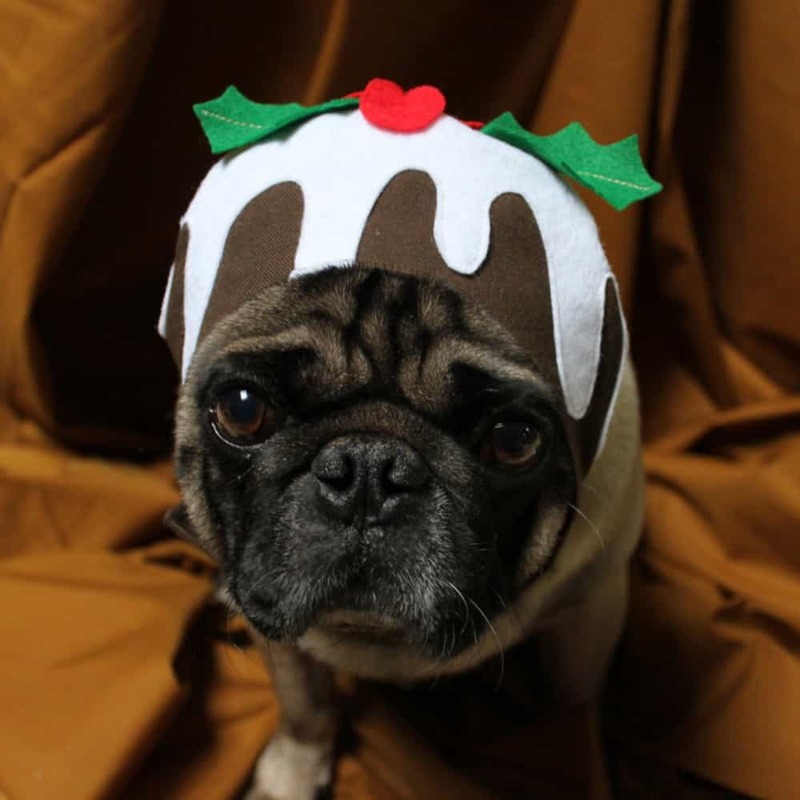 Again, it is worth considering your dog’s personality, some may not enjoy having a parcel under their nose. 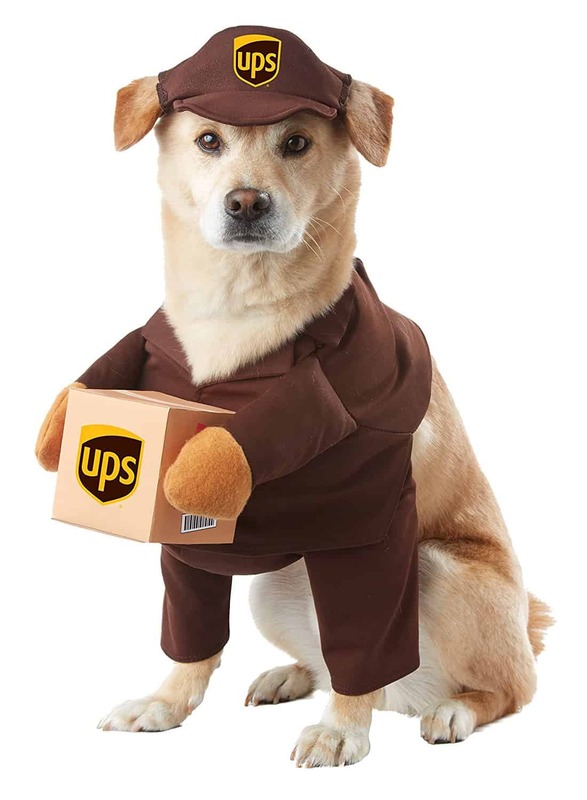 If your pup doesn’t mind, then this realistic UPS employee uniform is for your dog. 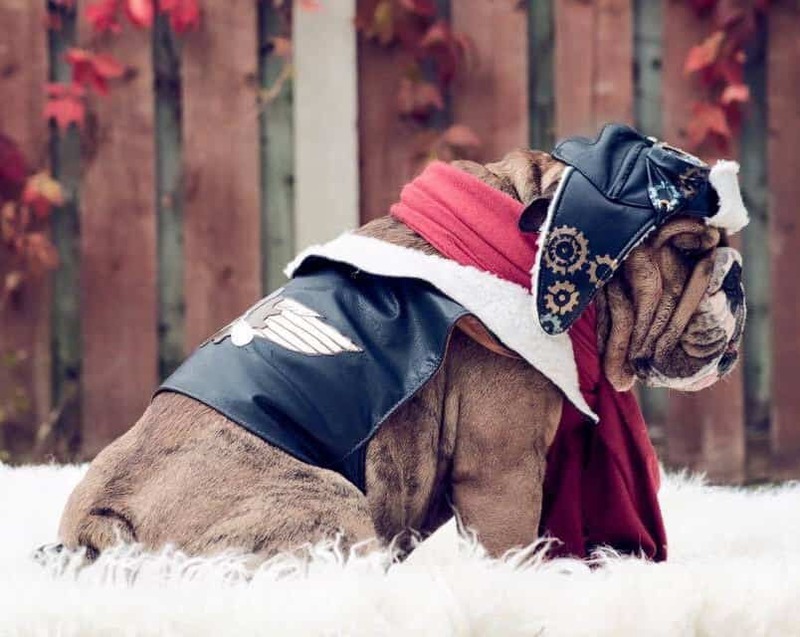 This costume provides a natural badass, old fashioned pilot look. 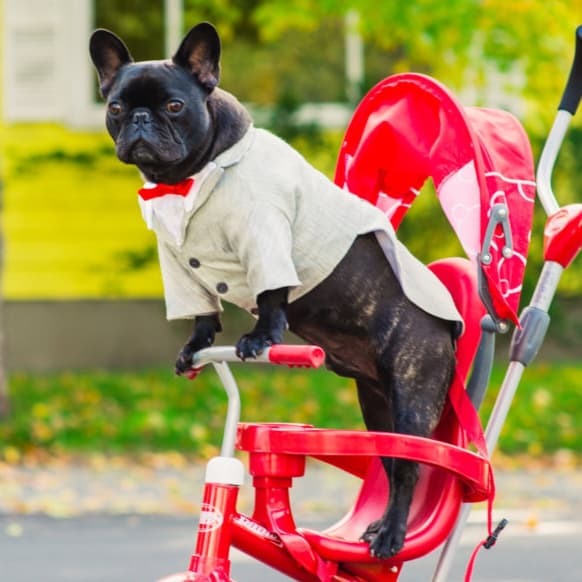 The set includes a fur lined leather jacket and a hat, with a pair of tinted flying goggles stylishly positioned as if pushed back on the dog’s head. The jacket is embellished with a pilot wings motif in metallic vinyl. There is also a reflective ribbon on the waist strap which makes it easy to glimpse in the dark. 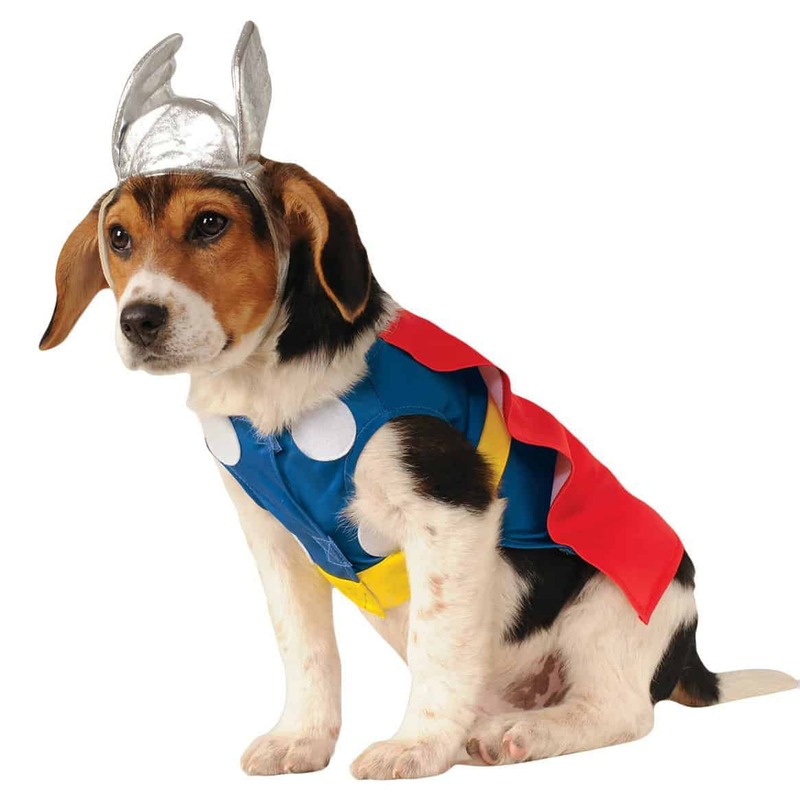 For dogs with ears that stand upright, there is the option to purchase the costume without the hat, which may not sit correctly. 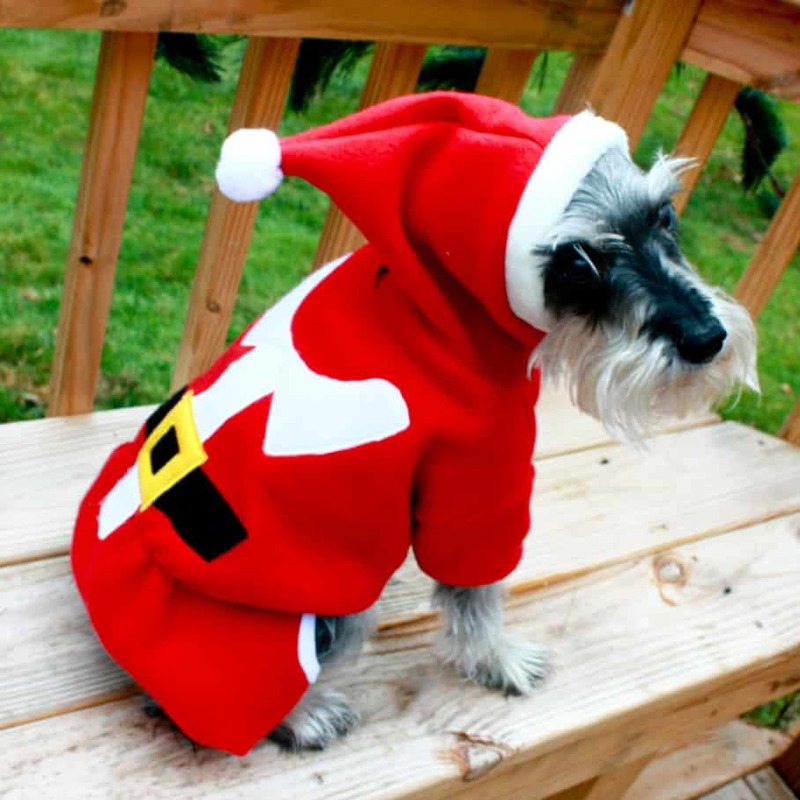 Whatever the occasion, it is only right to include your furry family members in the festivities too! 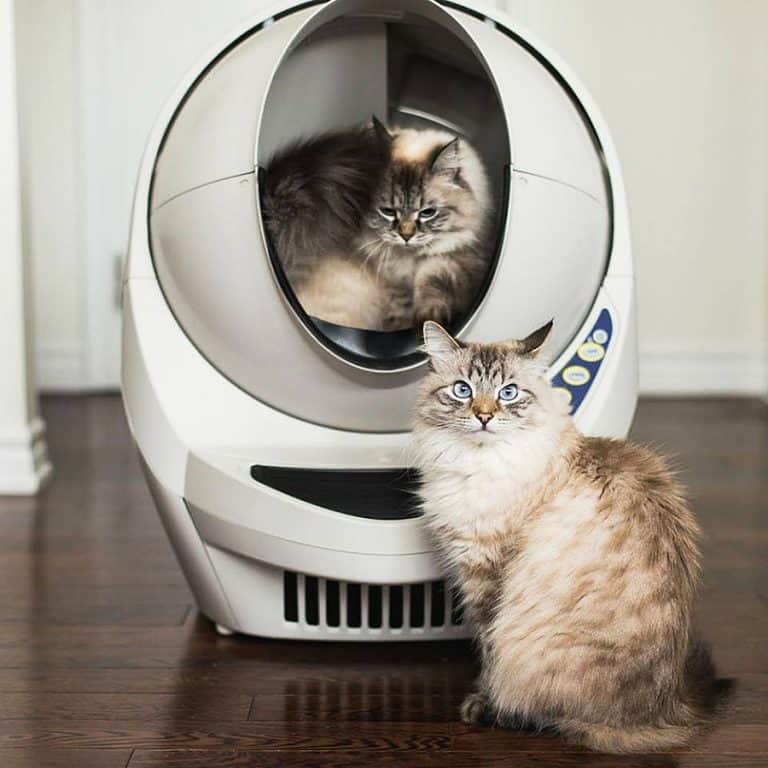 Whether they are little or large, these funny creatures love getting involved and being the center of attention. 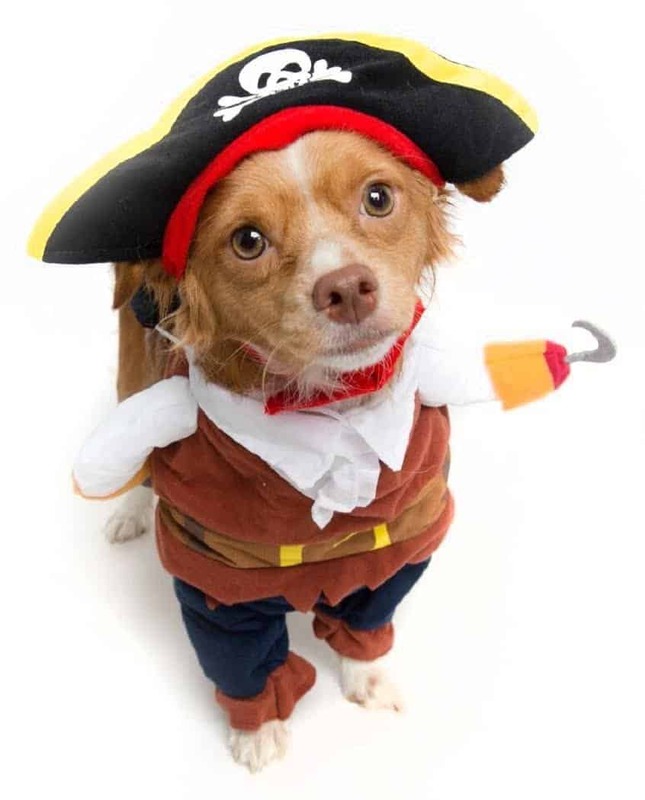 Hopefully you have now got lots of great ideas for small dog costumes or large dog costumes, and are about to embark on a journey of cuteness and photo shoots! Underwater beauty right on your desktop.